There is no need to wax poetic on the benefits of kale, because there has been so much good press on the power-veggie over the last few years, you’d have to be a hermit not to be aware. 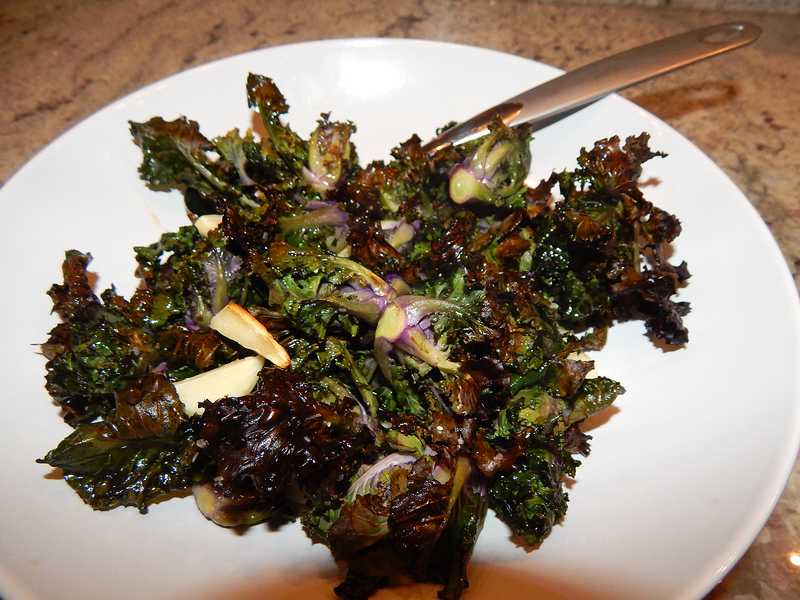 One night for dinner, to go along with my extra-thick, spicy pork chops, I wanted a simple side recipe for kale. 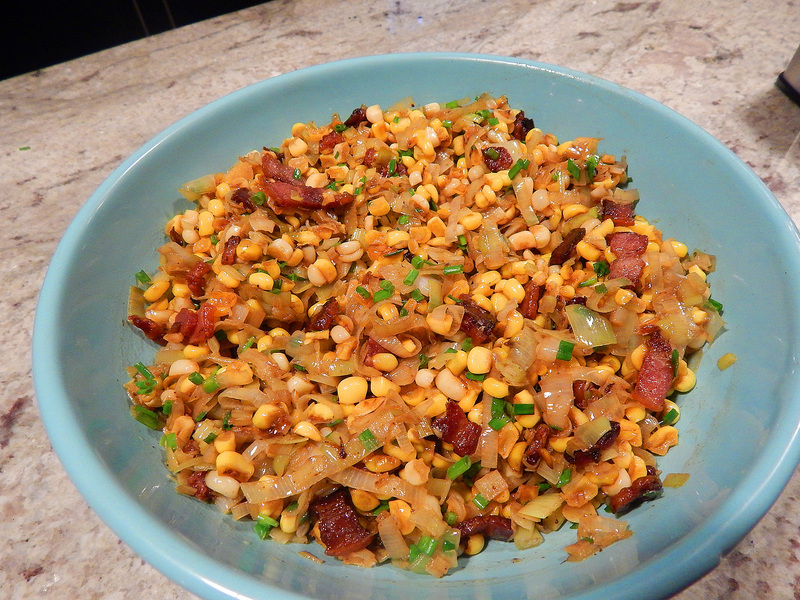 A version of this one popped up on NYT Cooking website by Sam Sifton. I made several adaptations however, and they are incorporated into the recipe below. Sam said this is a technique that elevates basic sautéed greens into something even more savory and tender, so I was game to try. As far as the olive oil, a 1/4 cup seemed a bit excessive for one bunch of the greens, so I reduced it to 2 tablespoons; I upped the number of garlic cloves slightly, and included one minced shallot. My burners tend to run very hot, so I adjusted the setting from high heat to medium to prevent burning, which I noted in the directions bellow. Heat olive oil in a large sauté pan set over medium heat until it shimmers. Add shallot and cook until soft, about 2 minutes. Toss in garlic slices and red pepper flakes and sauté for another minute. Add kale to the pan and add the stock. Use tongs to toss the greens in the oil and stock, then cover and cook for approximately 7 minutes, until it is soft and wilted, but still quite green. Remove cover and continue to cook, stirring occasionally until all the liquid has evaporated, another 1 to 2 minutes. Season to taste with salt and pepper, add the vinegar (or juice) using a wooden spatula to release any browned bits, and toss to combine. 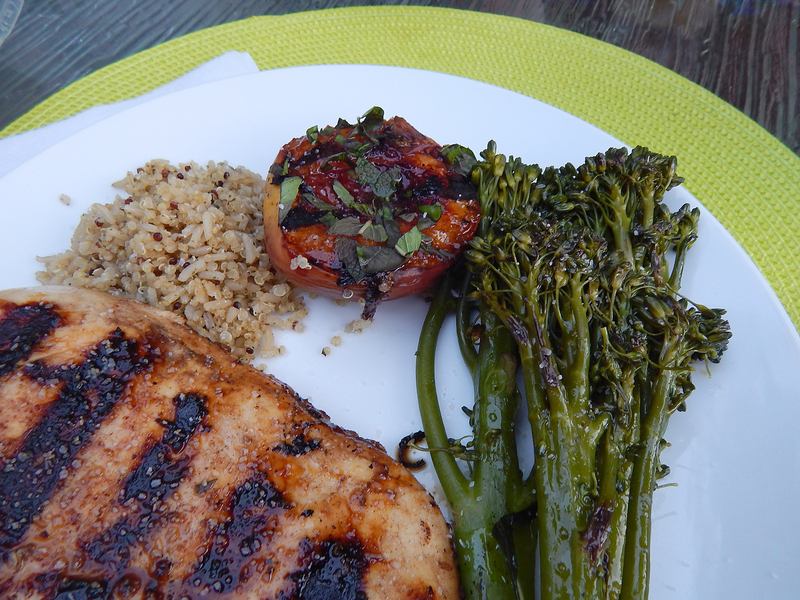 It made a great side dish for the Spice-Rubbed Grilled Pork Chop dinner. Grilled veggies, you gotta love ’em. And if you don’t, maybe you need to try these delicious Lime-Miso Marinated Grilled Asparagus. A few months ago, the recipe was printed in the Sunday newspaper supplement Parade, and it caught my eye immediately. BTW, the ingredients list using 1/2 teaspoon of white miso, but we felt a full teaspoon was in order because we really enjoy the taste of the paste. I thought it was a bit odd that the printed recipe said to use lemon zest, but didn’t include the amount, plus incorporate the juice of one lime. When it was time to write this blog, I Googled the recipe online and noted there it said to use the zest and juice of one lime, no lemons mentioned! Should have paid attention to my culinary instincts. The grilled asparagus was part of a Grilled Rack of Lamb dinner that also included reheated leftover Twice-Baked Potatoes. Now mind you, rack of lamb is a rare treat for us due to the high cost, but our favorite supermarket happen to have it on sale so we snatched up the last rack. It was already seasoned necessitating all we had to do was sear and grill it for the recommended amount of time. Dinner done. Combine first 6 ingredients in a shallow dish. Add asparagus. Toss to coat; let stand 20 minutes at room temperature. Thread asparagus evenly on 4 double-pronged skewers, leaving space in between to allow air to circulate; or toss in a shallow grill basket like we did. Grill 7-10 minutes over indirect heat, turning once, or until asparagus are tender and charred in spots. Sprinkle with flaky sea salt, if desired. An all-time favorite with friends and family, posting again in time for the Super Bowl. A super fabulous and seductively tender side dish from chef/author Molly Stevens—and you know how much we love her braised dishes! This Fennel Braised with Thyme and Black Olives recipe was a perfect accompaniment to our Chicken in Beer entrée, a heart-warming recipe from Lidia Bastianich’s cookbook Mastering the Art of Italian Cuisine, a Christmas present to Russ from his son David. Molly says don’t be at all put off by the anchovies in the recipe. They are discernible only as a bass note of flavor to match the higher tones of the sweet fennel. If you’re serving these to professed anchovy haters, don’t say a word. They’ll never guess what makes the dish taste so good. Trimming the fennel: If the fennel came with the feathery green stalks attached, use a large knife to chop these off right down at their base, where the bulb begins. Reserve a few of the brightest and freshest-looking fronds for garnish, and save the rest for stock or discard. If the very base of the fennel bulbs looks brown or at all dried out, slice off a thin sliver. Check the sides of the bulbs as well, and trim off any brown parts with a vegetable peeler. Cut each bulb in half through the core and then halve again, into quarters. Browning the fennel: Heat 2 tablespoons of the oil in a large heavy-based skillet (12-inch) over medium-high heat until it ripples. 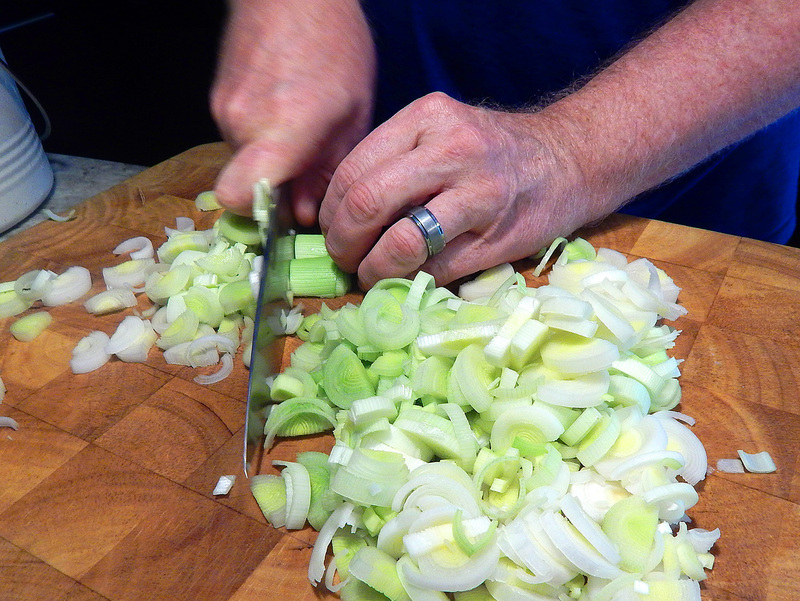 Add as many quarters of fennel as will fit without crowding, one cut side down. Leave the fennel undisturbed for 3 minutes—moving the pieces around will only slow down the browning process. With tongs, lift a few quarters to check to see if they’ve browned in spots. Because of its uneven surface, the fennel won’t brown evenly: you’re looking for patches of caramelization. Turn the quarters onto the other cut side and leave again until browned, another 3 to 4 minutes. Remove the quarters from the pan and arrange them browned side up in a large gratin dish or shallow baking dish (9- to 10-by-13- to 14-inches). Add the remaining oil to the skillet and brown the remaining fennel. Add this batch of fennel to the gratin dish, arranging it as best you can so the wedges line up in a single layer. It’s okay if the wedges are a bit cramped; they will collapse and shrink some as they braise. Season with salt and pepper. Scatter over the olives. The aromatics and braising liquid: Combine the garlic, anchovies, thyme, fennel seeds, and coriander in a small saucepan, and smash the mixture against the bottom of the pan with a wooden spoon to make a rough paste. Add the wine, bring to a boil over high heat, and boil until reduced by about half, about 2 minutes. Add the stock and bring to a simmer. The braise: Pour the seasoned liquid over the fennel, cover tightly with foil, and slide onto the middle rack of the oven. Braise until the fennel has collapsed and a small knife penetrates the core of the wedges with no resistance, about 1 hour and 15 minutes. Serving: If you reserved the feathery tops, chop them to give you about 2 tablespoons, and sprinkle them over the top of the braise. Serve warm or at room temperature. Bourbon Whipped Cream Topping, Oh My! You may have heard of famous Food Network Chef Bobby Flay and his TV show Throwdown with Bobby Flay, but if not, you can still create his luscious Throwdown Pumpkin Pie. For our Thanksgivng dinner, it was an excellent alternative to a regular custard pie and Russ’s new favorite pumpkin pie recipe. It was light, almost fluffy, with subtle but complex flavors from a varied list of ingredients. But I think the pièce de résistance was the Bourbon Whipped Cream topping! Because of his wheat intolerance Russ used gluten-free graham crackers when making the crust. And son Dan, who’s not really a pumkin pie afficionado, was impressed how good it was. I even had a small bite and found the flavors amazing. One step Russ didn’t think was necessary was straining the mixture into a bowl. First off, it was taking for-friggin-ever, plus it seemed to block much of the ingredients, so he aborted the process mid-stream. And that whipped cream topping? A real winner! A slice of pumpkin pie with the whipped cream on the left along with a piece of homemade cheesecake with chocolate chips. Cook’s Note: The filling makes more than what is needed to fill the pie shell. You are able to freeze the excess. What to do with some leftover spring veggies? Taking stock of what was lurking in the crisper, I uncovered several ounces of fresh sugar snap peas and a handful of asparagus stalks. And then it occurred to me that our latest issue of Cooks Illustrated featured an article on sautéed sugar snap peas, which seemed like a good place to start. The toasted pine nuts and fennel seeds before they are chopped. Starting to finely chop the nuts, seeds, lemon zest and red pepper flakes. Recipe title: Sugar Snap Peas with Pine Nuts, Fennel Seed and Lemon Zest. Insert the word “Asparagus” and I’m good to go! To ensure that the pods and peas cook through at the same rate, use a hybrid method that steams the sugar snap peas and asparagus briefly before sautéing them; the trapped steam transfers heat more efficiently than air does so that the veggies cook through more quickly. Cutting the peas in half and the asparagus at a strong angle, further reduces the cooking time, so the pea pods retain more of their snap, and the pockets capture the seasonings rather than letting them slide to the bottom of the platter. Sprinkling the veggies with the dukka dresses up the simple preparation with distinct (but not overwhelming) flavor and crunch. This veggie side dish is really, really good! Some other seasoning combinations could be: almonds, coriander seed and orange zest; or sesame seeds, fresh ginger and lemon zest. Because I always tend to measure seasonings on the broader scale, we had enough dukka leftover for a future vegetable side, so I put it in a small ziploc in the freezer until ready to use. 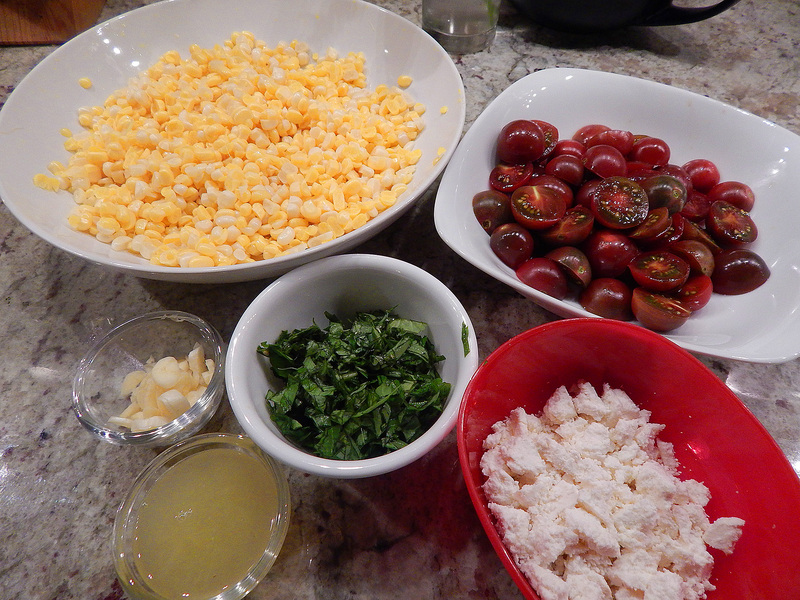 The ingredients prepped and measured. Our snap pea and asparagus side paired with a salmon patty. Do not substitute ground fennel for the fennel seeds in this recipe. Toast pine nuts in 12-inch skillet over medium heat, stirring frequently, until just starting to brown, about 3 minutes. Add fennel seeds and continue to toast, stirring constantly, until pine nuts are lightly browned and fennel is fragrant, about 1 minute longer. Transfer pine nut mixture to cutting board. Sprinkle lemon zest, salt, and pepper flakes over pine nut mixture. Chop mixture until finely minced and well combined. Transfer to bowl and set aside. Heat oil in now-empty skillet over medium heat until shimmering. Add snap peas and water, immediately cover, and cook for 2 minutes. Uncover, add garlic, and continue to cook, stirring frequently, until moisture has evaporated and snap peas are crisp-tender, about 2 minutes longer. Remove skillet from heat; stir in three-quarters of pine nut mixture and basil. Transfer snap peas to serving platter, sprinkle with remaining pine nut mixture, and serve. I’ve always adored mashed potatoes. They are to me that quintessential comfort food that brings back fond childhood memories of Sunday family dinners. Even the pickiest of kids (which I was) usually eat mashed potatoes. This is the second time we cooked them and made sure that we purchased a larger quantity than the paltry 4 little “snips” our first go around. You can use a food processor, ricer, or potato masher to obtain your preferred consistency. Use as a side dish for anything that you would normally include mashed potatoes with. You’ll be surprised how much you like them! About 8-10 parsnips equal 1 1/2 pounds, depending on size, and yield about 3-4 cups of mashed parsnips. Cook in boiling water until they can easily be pierced with a fork, about 7 minutes. Drain well. 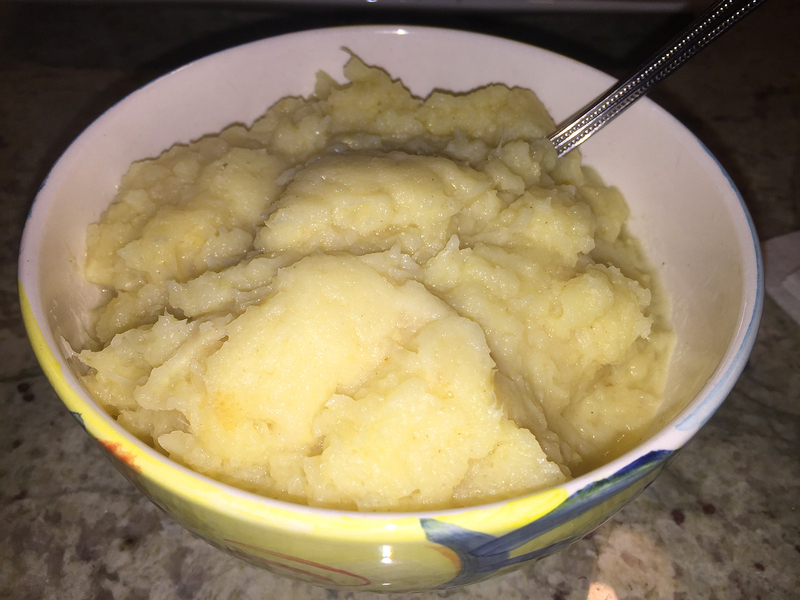 Purée the parsnips in a food processor (preferable), ricer, or masher. and a 1/2 teaspoon honey. 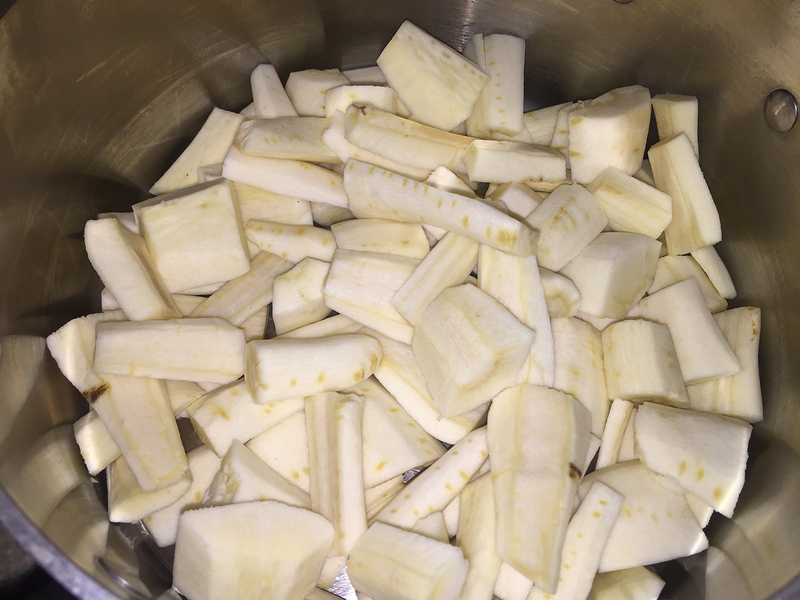 Peeled, cored and sliced parsnips are ready to be boiled. If you’re in the mood for a tasty snack that doubles as a phenomenal health food, look no further than pumpkin seeds. We especially like them roasted with spices. Sometimes we just toss together any combination of spices, or as in this case, we used Emeril’s Southwest Seasoning (recipe follows) to make our Roasted Spiced Pepitas. With a wide variety of nutrients ranging from magnesium to copper, protein and zinc, pumpkin seeds are nutritional powerhouses wrapped up in a very small package. They also contain plant compounds known as phytosterols and free-radical scavenging antioxidants, which can give your health an added boost. Best of all, because pumpkin seeds are highly portable and require no refrigeration, they make an excellent snack to keep with you whenever you’re on the go, or they can be used as a quick anytime snack at home, too. So go ahead an make yourself a batch! Place raw pepitas into a medium bowl. Mix olive oil into seeds, followed by most of the dry seasoning. Layer onto a rimmed baking sheet and sprinkle on remaining seasonings. Every 4-5 minutes turn pepitas with a spatula. Let tray of seeds cool to room temperature, then store in an airtight container. FYI Men: Pumpkin seeds have long been valued as an important natural food for men’s health. This is in part because of their high zinc content, which is important for prostate health. FYI WOMEN: Pumpkin seed oil is rich in natural phytoestrogens and studies suggest it may lead to a significant increase in good “HDL” cholesterol along with decreases in blood pressure, hot flashes, headaches, joint pains and other menopausal symptoms in postmenopausal women. Preheat your oven to 400 degrees, or 375 on convection. Mix one pound of raw pepitas with one tablespoon of olive oil in a medium bowl. Mix together two tablespoons of Emeril’s Southwest Seasoning* (or your own combination) with one tablespoon of fine popcorn salt. Toss most of this mixture in with the oiled seeds until well distributed and then layer onto a rimmed baking sheet. Sprinkle remaining spices over the top. Roast for 20 minutes, turning with a spatula every 4 to 5 minutes. Let cool before eating or storing. Mix all together thoroughly and store in an airtight container. Not a big fan of broccoli rabe, we wanted a dependable, quick broccoli recipe that promised to deliver less bitterness and a rounder, more balanced flavor. We found that blanching the rabe in a large amount of salted water tamed its bitterness. Then the blanched rabe is sautéed with ingredients that complement its strong flavor, such as garlic, red pepper flakes, and sun-dried tomatoes. Plus this method keeps the vegetable a bright green instead of the somber dark green that is often served. It paired real well with our leftover lamb roast and potato gratin and made quick work of preparing a weeknight meal. A squeeze of fresh lemon and/or a sprinkle of freshly grated parmesan would likely be a tasty finisher. Heating oil, garlic, red pepper, and sun-dried tomatoes in skillet. Adding the blanched broccoli rabe to the other ingredients to heat through. 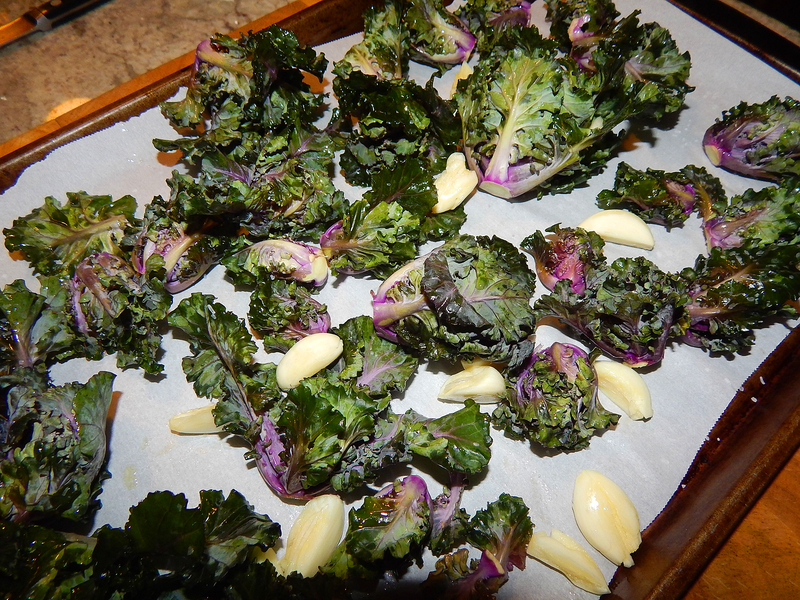 Using a salad spinner makes easy work of drying the cooled blanched broccoli rabe. This recipe can be turned into a main course pasta dish. Increase the oil to 4 tablespoons and toss the broccoli rabe with 1 pound of pasta, cooked al dente. Season to taste with salt and ground black pepper, and serve with grated Parmesan cheese. Bring 3 quarts water to boil in large saucepan. Stir in broccoli rabe and salt and cook until wilted and tender, about 2 1/2 minutes. Drain broccoli rabe and set aside. Cool empty saucepan by rinsing under cold running water. Fill cooled saucepan with cold water and submerge broccoli rabe to stop the cooking process. Drain again; squeeze well to dry. Heat oil, garlic, red pepper, and sun-dried tomatoes in medium skillet over medium heat until garlic begins to sizzle, about 3 to 4 minutes. Increase heat to medium high, add blanched broccoli rabe and pine nuts, and cook, stirring to coat with oil, until heated through, about 1 minute. Season to taste with salt; serve immediately. 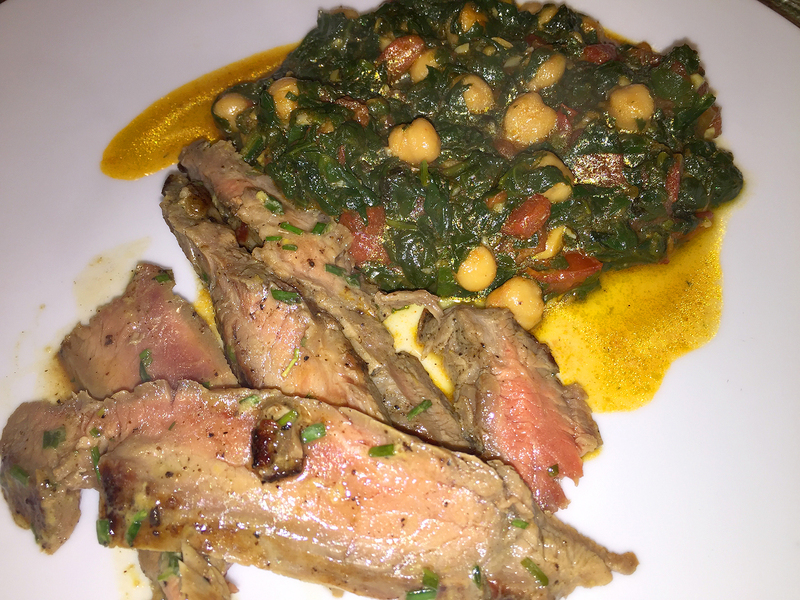 A classic Arab-influenced specialty of cooked spinach braised in olive oil together with chickpeas and spices, this simple peasant soup is often served with toasted or fried bread doused with vinegar and hard-boiled egg added at the end. We made it as an accompaniment to a seared flank steak—but with the fried bread, and or pine nuts and parsley, it could suffice as a light meal. Recipe found in our copy of “The New Spanish Table” by Anya von Bremzen. Cooking the garlic and spices. Adding the chopped tomatoes to garlic and spices. Chickpeas added to the tomato mixture. Using a mortar and pestle to create the paste. Measured vinegar and mortar mixture. Rinse but do not drain the spinach. Place the spinach in a large, wide saucepan over medium heat and cover the pan. Cook the spinach in the water that clings to its leaves until wilted, 4 to 5 minutes, stirring a few times. Transfer the spinach to a colander and squeeze out the excess moisture by pressing a large spoon against the spinach. When just cool enough to handle, chop it medium-fine. Heat 3 tablespoons of olive oil in a 10-inch skillet over med-low heat. Add half of the garlic and cook, stirring until fragrant, about 1 minute. Add the red pepper flakes, cumin, oregano, nutmeg and cinnamon and stir for a few seconds. Add the tomatoes and cook, stirring, until the mixture is slightly thickened and reduced, about 5 minutes. 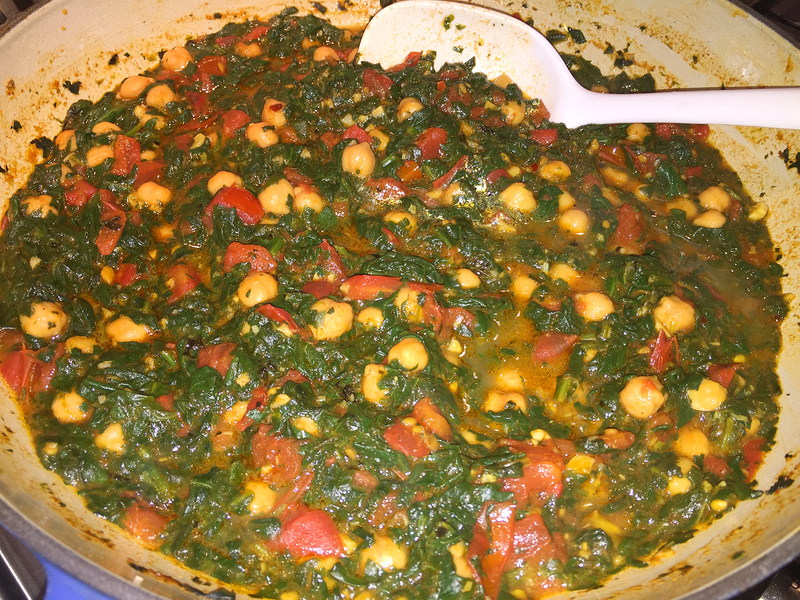 Add the spinach and chickpeas with their liquid and bring to a simmer. Add the saffron, sugar, salt and pepper to taste and cook uncovered, stirring once or twice, until the spinach is very tender and has absorbed some of the liquid, 8 to 10 minutes. While the spinach is cooking, place the remaining garlic in a mortar and, using a pestle, crush it to a paste. Add the vinegar to the mortar and stir the garlic mixture into the spinach. Cook until the flavors meld, 2 to 3 minutes. Let the spinach cool to warm, about 15 minutes, before serving. (OPTIONAL) If serving with the fried bread, pour olive oil to a depth of 1/2-inch into a small skillet. Heat it over med-high until a piece of bread placed in the hot oil sizzles on contact. Working in two batches, fry the bread until golden and crisp, about 45 seconds per side. Using a slotted spoon, transfer the bread to drain on paper towels. To serve the spinach, spoon it into a shallow serving dish. Arrange the fired bread slices around the spinach and serve. Summer is winding down and so is some of our fresh herbs and vegetables. One crop at it’s tail end is our pole beans. We’ve become so accustomed to quick-cooking green beans just until crisp and bright, that we hadn’t thought of tender slow-cooked beans. Until Russ remembered our favorite braising author Molly Stevens! 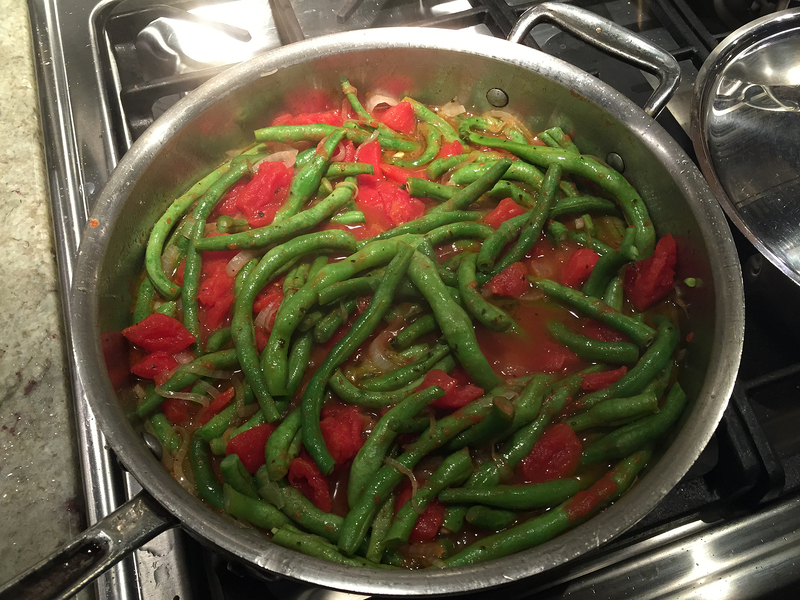 With a quick thumb-through of her All About Braising cookbook, we located the recipe for End-of-Summer Green Beans Braised with Tomatoes. When left to braise for an hour with summer ripe tomatoes, the beans become supple, sweet and oh-so satisfying. If you don’t have any growing in your garden, stop by a farmer’s market and pick up some locally grown ones as the season is winding down. It’s a great way to cook beans that are beginning to bulge and show signs of being overly mature, as ours were. 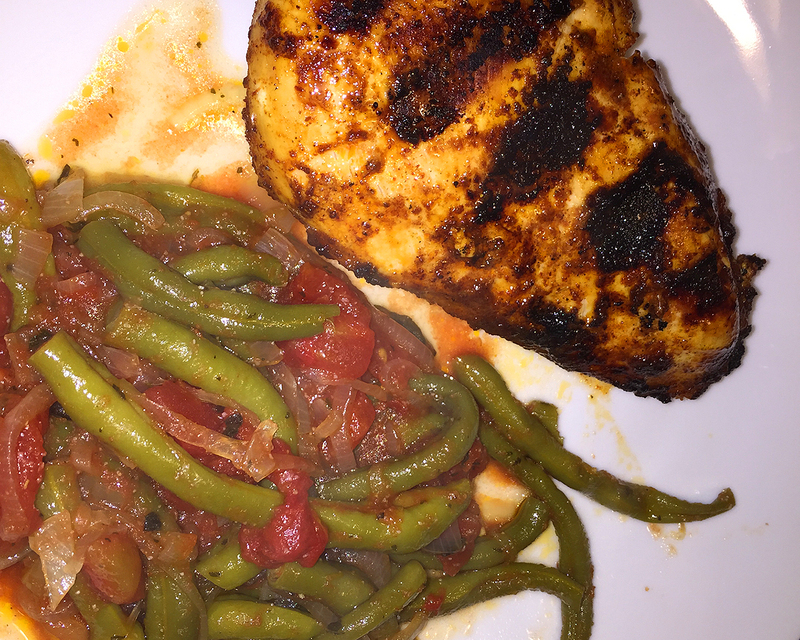 As Molly says, do not substitute skinny haricot verts. The aromatics: Heat the oil in a large lidded skillet (12 to 13 inch) over medium heat. Add the garlic and sauté gently until it releases its fragrance and just begins to show touches of gold on the edges, about 2 minutes. Do not let the garlic brown. 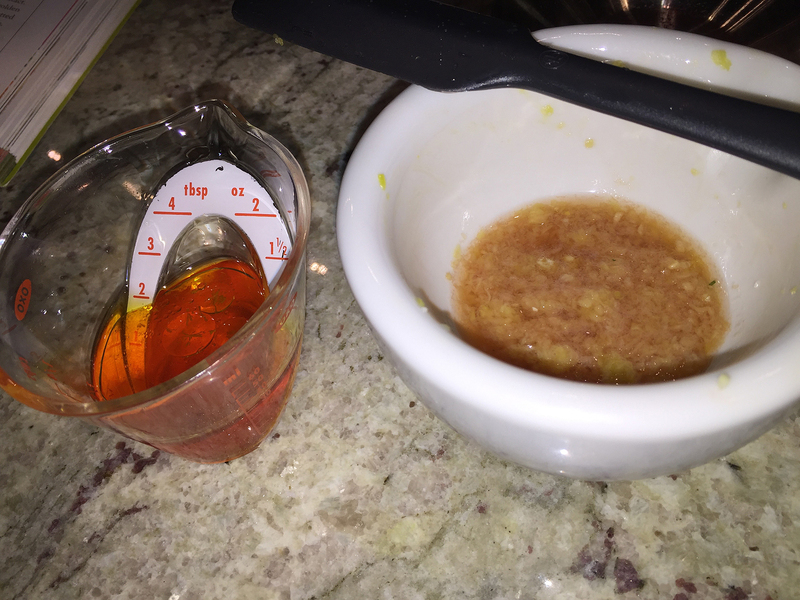 The braising liquid: Add the anchovies and oregano, smashing the anchovies with a wooden spoon to blend them into the oil, and sauté for a minute longer. Immediately add the green beans, stirring and tossing to coat them with the oil and seasonings. Add the tomatoes and bring to a simmer. Add the water and season with salt and pepper. The braise: Cover, lower the heat to a gentle simmer, and braise the beans, stirring occasionally and checking to make sure that they are not simmering too energetically. Lower the heat if needed. Continue to braise gently until the beans are completely soft and are beginning to wrinkle but not splitting apart or falling open, about 1 hour. The finish: If the beans are swimming in sauce, remove the lid, increase the heat, and boil for 3 to 5 minutes until the sauce is the consistency of a loose tomato sauce that generously coats the beans. Taste for salt and pepper. Serve hot or warm. This veggie dish was so good we had it two nights in a row, first with some grilled chicken breasts, and again with grilled tuna steaks. 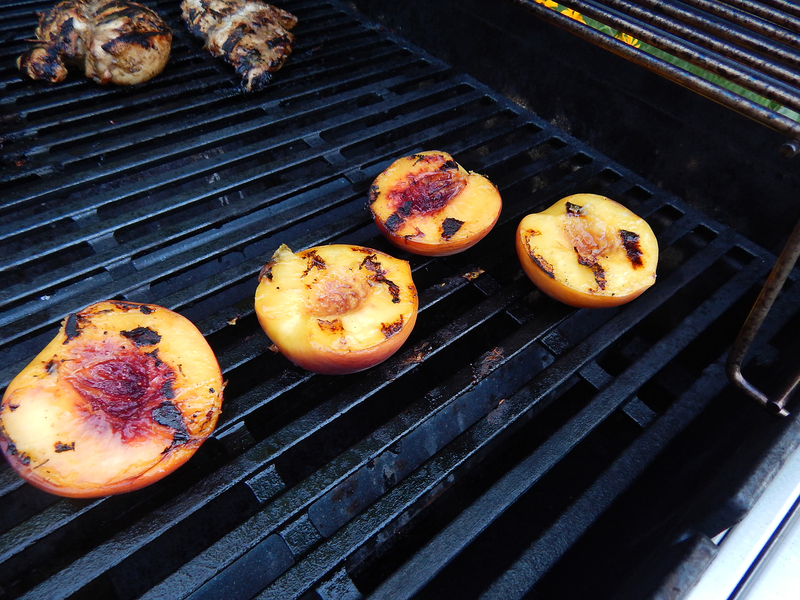 Maybe you’ve grilled fruit before, maybe not. I think I did, years ago, but can’t be real sure. Yet this summer I came across numerous articles on the subject and couldn’t get it out of my mind. Then a few weeks ago the opportunity presented itself when I had two ripe peaches that needed to be dealt with before they turned—you know what I mean—all of a sudden a perfectly ripe peach is brown and mushy and has to be thrown away. When grilling some chicken breasts for dinner one weeknight I thought “why not cut the peaches in half and grill them too?” With some Milanese Gremolata flavored olive oil and a splash of a good Tangerine Balsamic vinegar, I brushed the cut side of each half and placed them directly on the hot gas grill. The length of cooking time will depend on the ripeness of your fruit and the heat of the grill, usually 5 minutes will suffice. 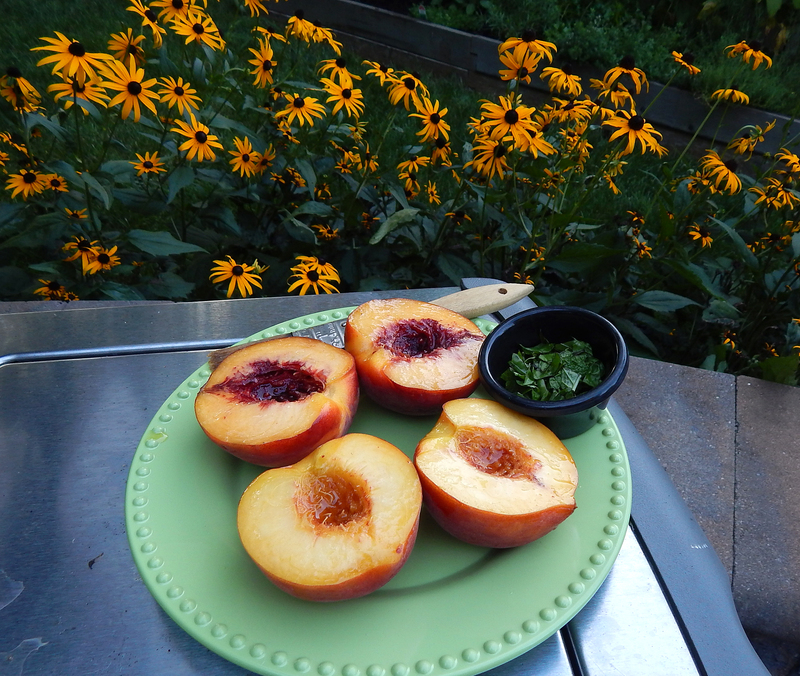 In my case, I turned them once to get grill marks on both sides then once removed, sprinkled the peaches with a smattering of fresh basil and mint picked from our herb garden and added a light sprinkle of sea salt. The result was one of the simplest, most satisfying side dishes I’ve had, as well as one of the easiest ways to impress yourself or a backyard full of partygoers. While some stone fruit purists might be wary (“If you already have sweet, ripe peaches, why mess with perfection?”), most will be convinced after one bite. They were a perfect pairing for the chicken and quinoa and brown rice side. If you prefer the grilled fruit as a dessert as opposed to a savory part of the main meal, consider adding cinnamon sugar butter, or drizzling them with honey and a dollop of vanilla yogurt. Whatever your preference, this is the time of year to experiment with ripe fresh fruit! Rinse peaches and blot dry. Cut each in half and discard pits. Combine melted butter, brown sugar, rum, cinnamon and nutmeg in a bowl. Mix thoroughly until sugar dissolves then set aside. Oil and preheat grill to high heat. 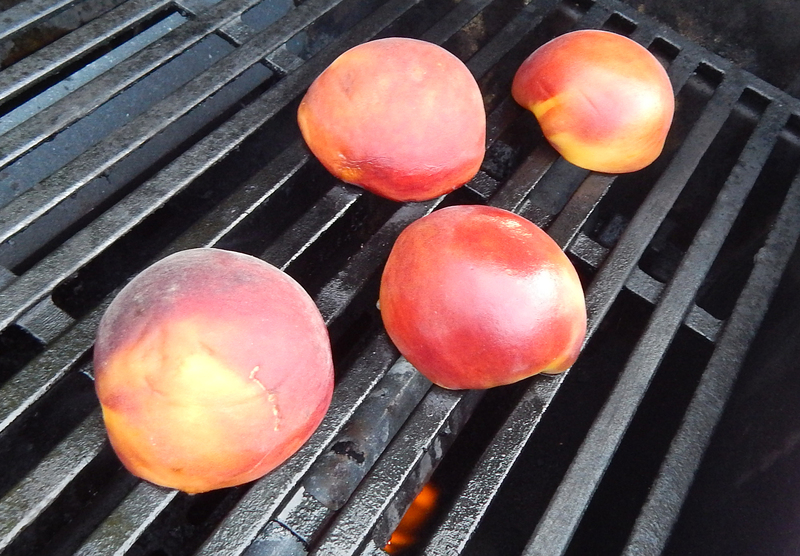 Grill peaches until nicely browned, 3 to 4 minutes per side, basting with rum butter glaze. 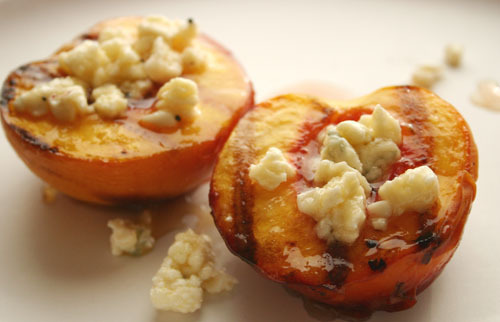 Serve at once, spooning any remaining glaze over the grilled peaches. Garnish with almonds, if desired. 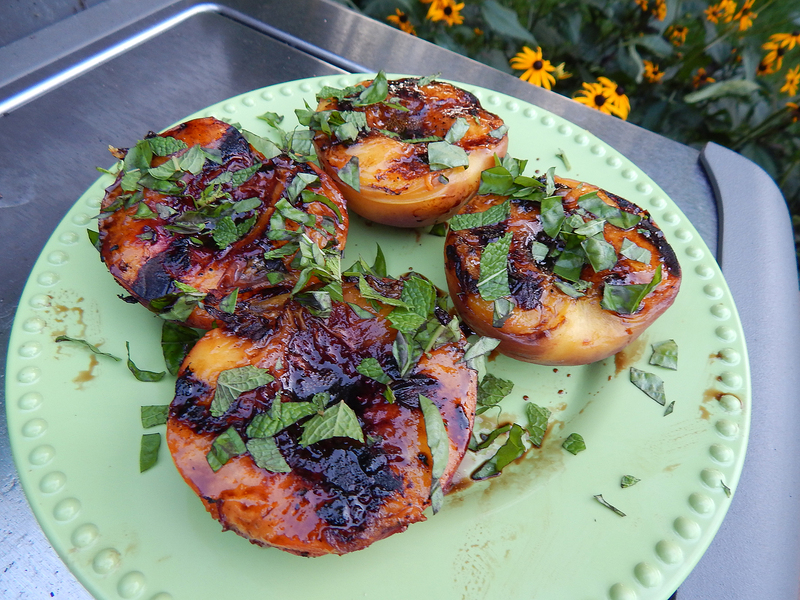 LYNN’S PARTY NOTE: Use grilled pineapple slices as as base for the peach halves and fresh cilantro as garnish. The peach rests nicely in the cavity from the cored pineapple and adds a visual decorative note. Nothing beats the flavor and fragrance of fresh-picked strawberries! June is ever-anticipated in our household because it is fresh strawberry season! And while you can get them all year long in the supermarket, the season for delicious, to-die-for local berries is very limited. 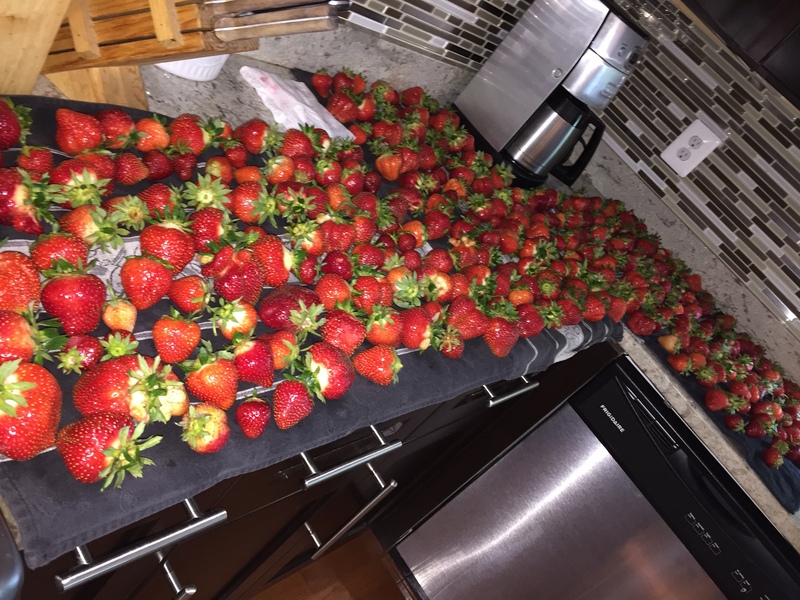 So as soon as we got back from our trip out to Western PA., I stopped at a local farm nursery and picked up two flats—that’s 16 quarts—of just picked strawberries. I immediately dumped them all in a cool bath in the kitchen sink to wash off the sand and debris. You cannot soak the fruit because it will zap away the flavors. Strawberries are best when prepared and eaten in the same day, but if you must keep them longer, store them in your refrigerator. Arrange the berries in a shallow container, separating out any damaged berries. Cover them loosely, and keep at 35 degrees for best results. Do not remove the caps or wash the berries until you are ready to use them. When caps are removed before use, the berries lose some of their moisture. Washing early tends to bruise them and the berries lose their freshness. Washing strawberries is a bit of tricky business. You see strawberries are frighteningly like sponges — they tend to soak up as much water as they can get into contact with. 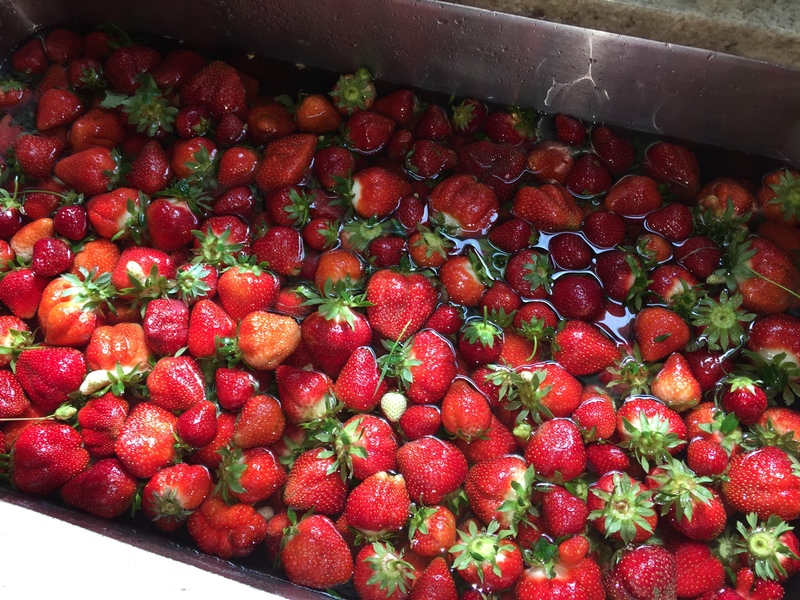 So, long story short, give strawberries a quick rinse in cool water and a swift pat with a clean cloth or paper towels to dry them off when, and only when, you’re ready to eat or cook with them. Obviously we couldn’t eat 16 quarts by ourselves so we froze most of them in vacuum-sealed freezer bags. That way when strawberry season is over, we have them for many months to come for use in fruit smoothies or other applications. Some favorite ways to eat them are sliced atop a bowl of cereal; with plain or vanilla yogurt; whole with a smattering of splenda; and in fruit or summer salads. 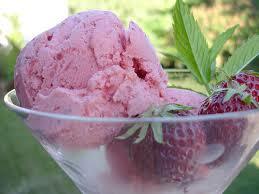 Russ takes it up another notch with his homemade strawberry ice cream. 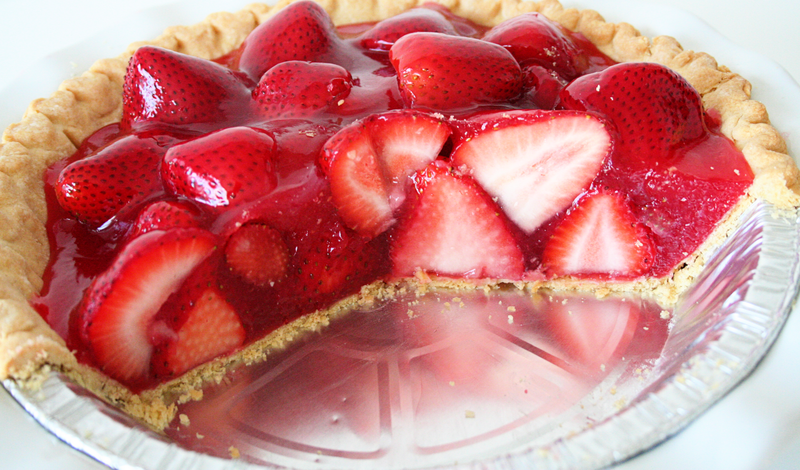 And if his son Dan is in town, we concoct his favorite—a fresh strawberry pie with a graham cracker crust. 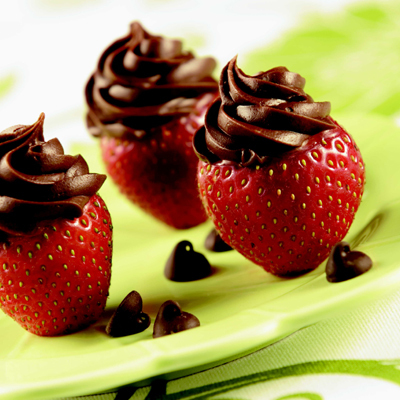 Here’s an interesting twist on an old favorite: chocolate covered strawberries. 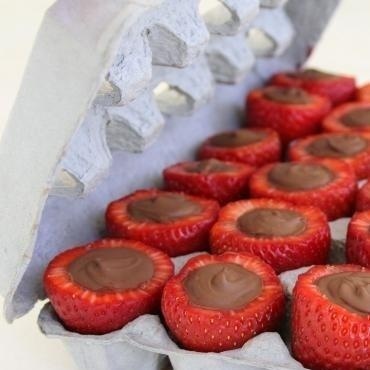 But in this case the chocolate is on the inside of the inverted berry and stored in egg cartons—Inside-Out Chocolate Strawberries—brilliant! I saw it on Pinterest and can’t wait to make some of my own for an upcoming party. 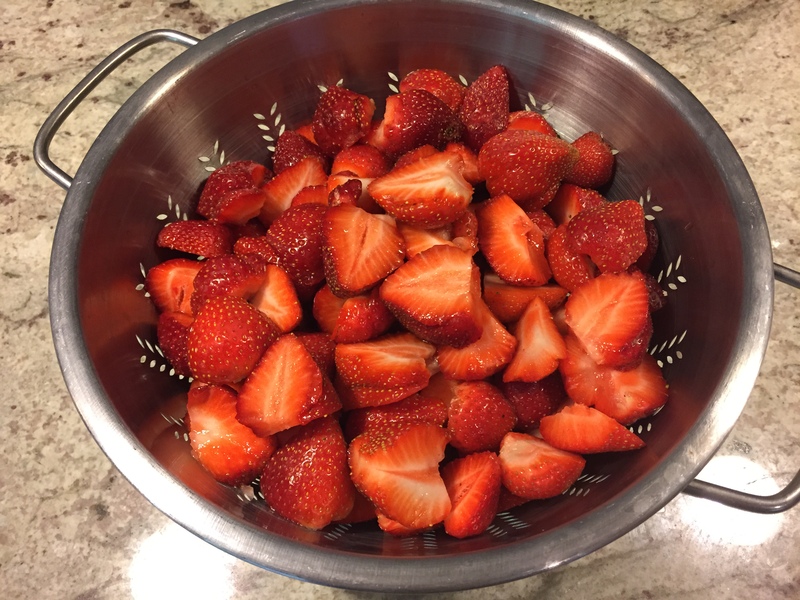 REMOVE stems and part of inner parts of strawberries to form a small bowl. Cut a sliver off of bottom of each strawberry so that strawberry will stand on end; discard slivers. Or, don’t slice off the bottom and store in an egg carton. I mentioned in a recent blog that good friend and partner in crime, Rosanne, created a gorgeous, and super tasty appetizer platter. 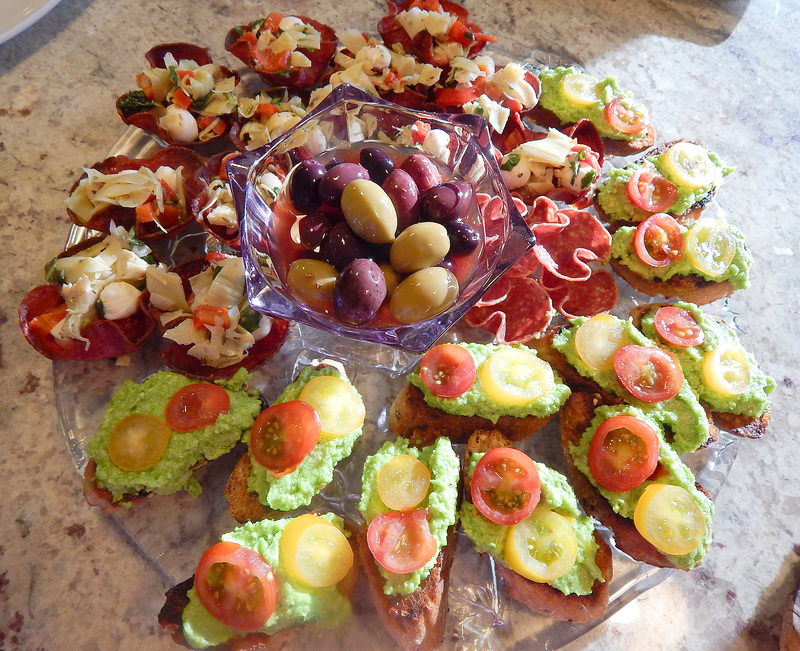 While she plated several different hors d’ oeuvres, one favorite stand out was a Pea Pesto Crostini, (pictured bottom right) recipe courtesy of Giada Delaurentis. Perfect for spring not only in color, but using peas as a substitute for the pesto! “When I originally made the crostini, I heated some olive oil and pressed some garlic into it to baste the bread slices. Fill a pot with as many eggs as you want and cover with cold water an inch above the eggs. Bring to a rolling boil and shut off the burner. Since I have a gas stove, I just leave it on the burner. Let sit for 12 minutes, drain and pop into an ice water bath for 15 minutes. Drain and peel immediately. On the cutting board Russ rolled up some Serrano ham slices and added a hunk of Iberico cheese. Needless to say we didn’t have to order appetizers at the restaurant that evening! 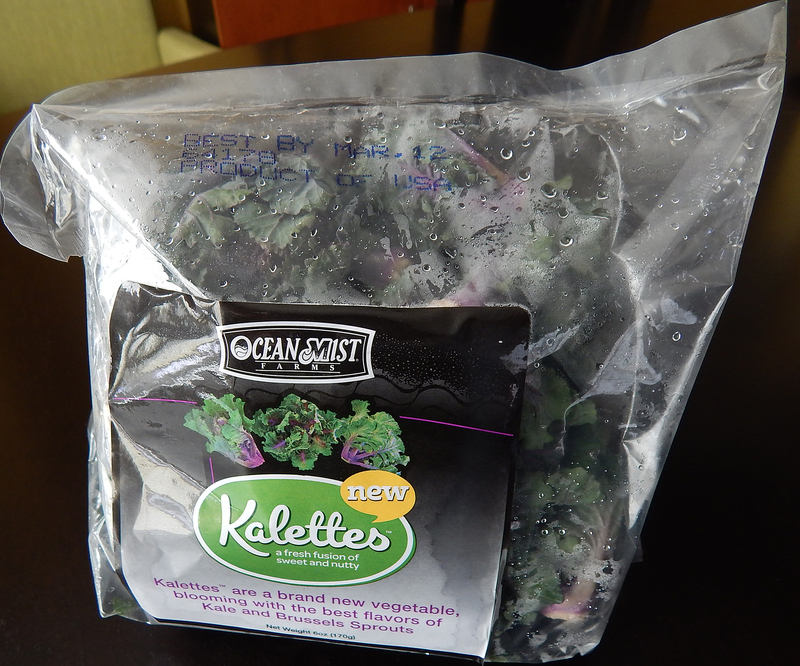 Kalettes is a brand new vegetable; a small green and purple sprout with curly leaves. 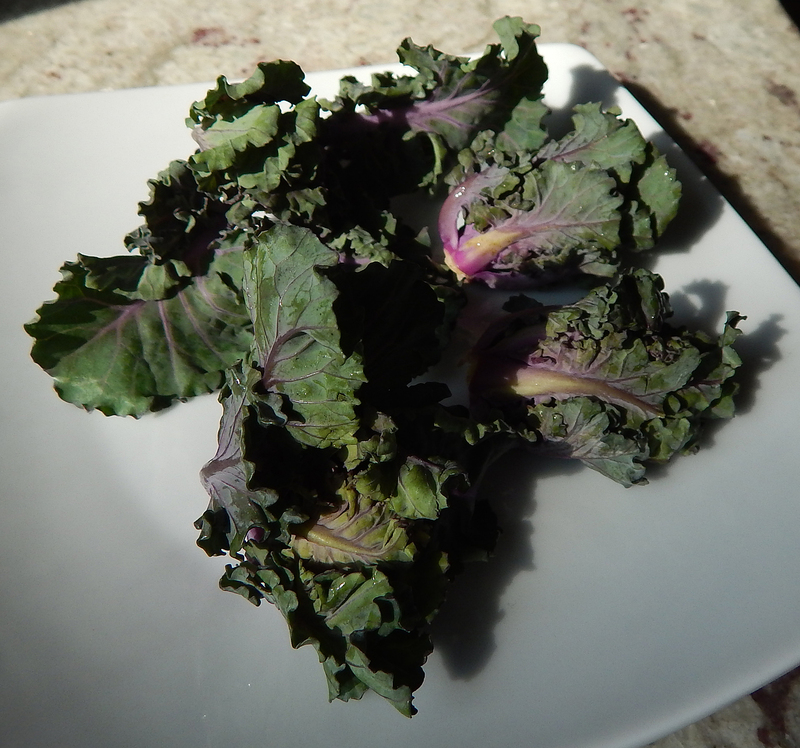 It is a cross between two real ‘Superfoods’, brussels sprouts and British kale. A fresh fusion of sweet and nutty, the inspiration behind Kalettes came from a desire to create a kale type vegetable which was versatile, easy to prepare and looked great. Not only do they have great flavor but they can be cooked in a variety of ways; sautéed, roasted, grilled or eaten raw. Kalettes are the product of 15 years of hard work and dedication (using traditional breeding techniques) from the British vegetable seed house Tozer Seeds. They are a non-GMO vegetable developed through traditional hybridization and not genetic modification. Known as Flower Sprouts in the U.K., this delicious vegetable has now made its way across the pond and is called Kalettes in North America. The name was changed to appeal more to America’s obsession with kale’s health benefits. What are you waiting for? Make sure to pick some up on your next food shopping foray! 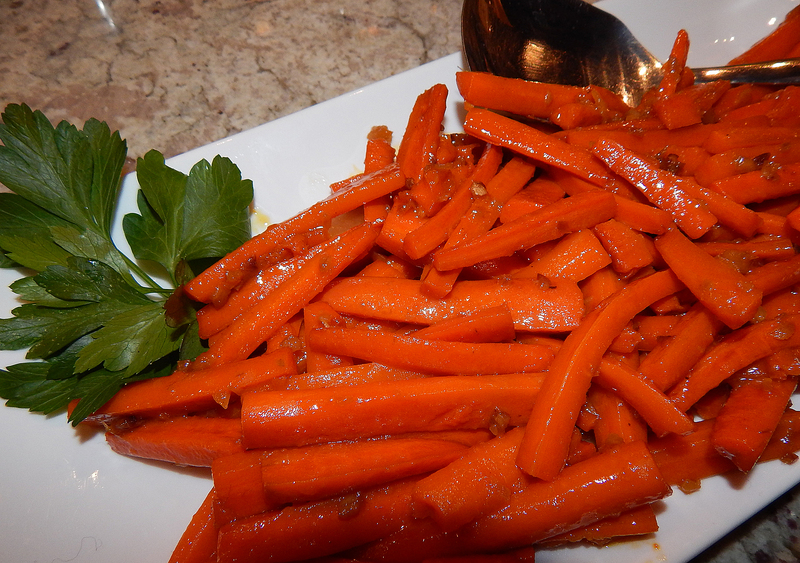 Courtesy of the fresh ginger, these carrots have a nice spicy kick, but a touch of maple syrup mellows them. Try to keep the size of your carrot “sticks” as consistent as possible so they cook at about the same rate; err on the smaller size if you have to. This side dish accompanied one of my all time “Sentimental Favorites,” Orange Juice Chicken (you can find the blog under the tab of the same name.) 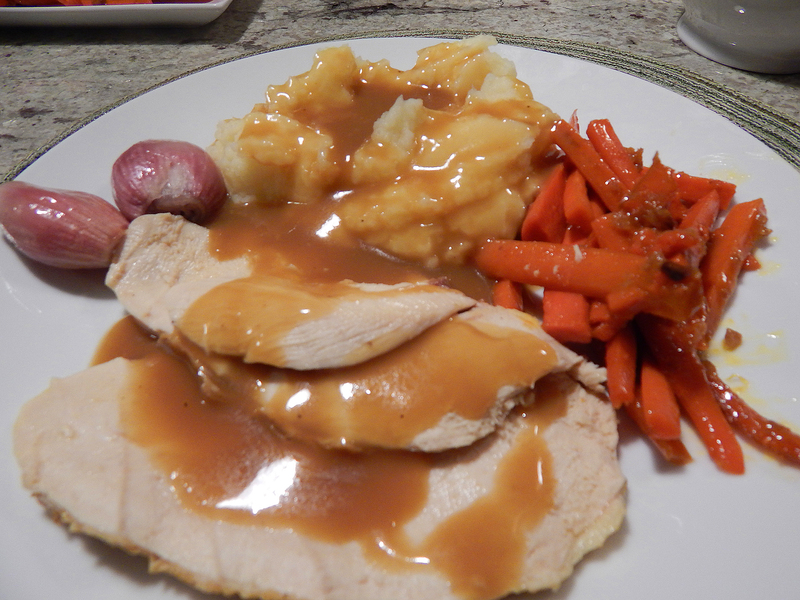 And yes we did serve with creamy, garlicky mashed potatoes and homemade gravy. Be sure to fill the chicken cavity with aromatics to add another depth of flavor. This time around I stuffed it with lemon halves, small whole shallots, fresh rosemary and parsley sprigs, and a couple of celery sticks. 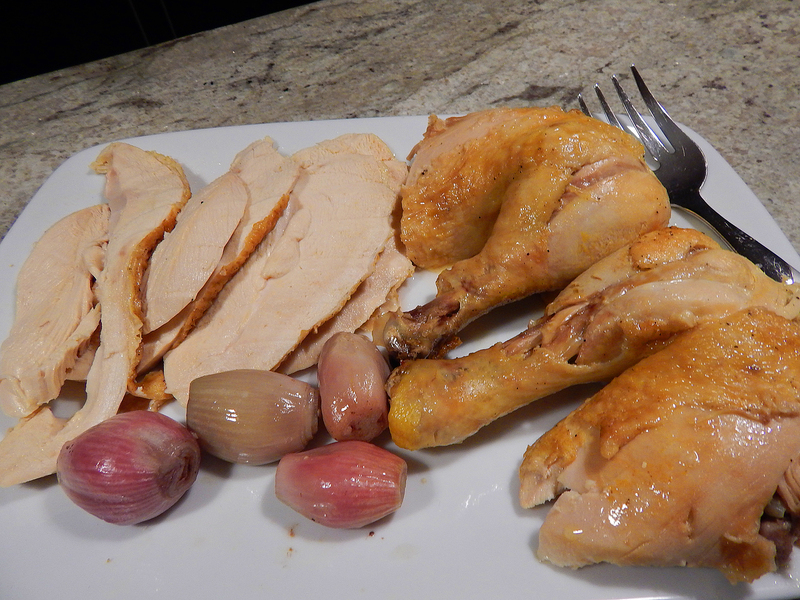 After the chicken is roasted and rested, discard the stuffed ingredients, EXCEPT for the shallots, they make a fabulous side! Combine the maple syrup, lime juice, and 1 Tbs. water in a small dish and set near the stove. Set a shallow serving dish near the stove, too. In a 10-inch straight-sided sauté pan, heat 1 Tbs. of the butter with the olive oil over medium-high heat. When the butter is melted, add the carrots and season with 3/4 tsp. salt. Toss with tongs to coat well. Cook, gently tossing occasionally at first and then more frequently, until most of the carrots are well browned and tender when pierced with a fork, 6 to 9 minutes (if the carrots aren’t fully tender but look like they’re burning, reduce the heat to medium). Reduce the heat to low, add the remaining 1 Tbs. butter and the ginger and cook, stirring and scraping the bottom of the pan with a heatproof rubber spatula, until the butter has melted and the ginger is fragrant, 15 to 20 seconds. Carefully add the maple syrup mixture and cook, stirring, until the liquid reduces to a glazey consistency that coats the carrots, 15 to 20 seconds. Immediately transfer the carrots to the serving dish, scraping the pan with the spatula to get all of the gingery sauce. Let sit for a few minutes and then serve warm. OPTIONAL: Sprinkle with sesame seeds and/or chopped fresh parsley for a more interesting presentation. TIP: To prep the carrots, cut each crosswise into 4-inch lengths and then halve each piece lengthwise. Put each piece on a flat cut side and slice lengthwise 1/3 inch thick. 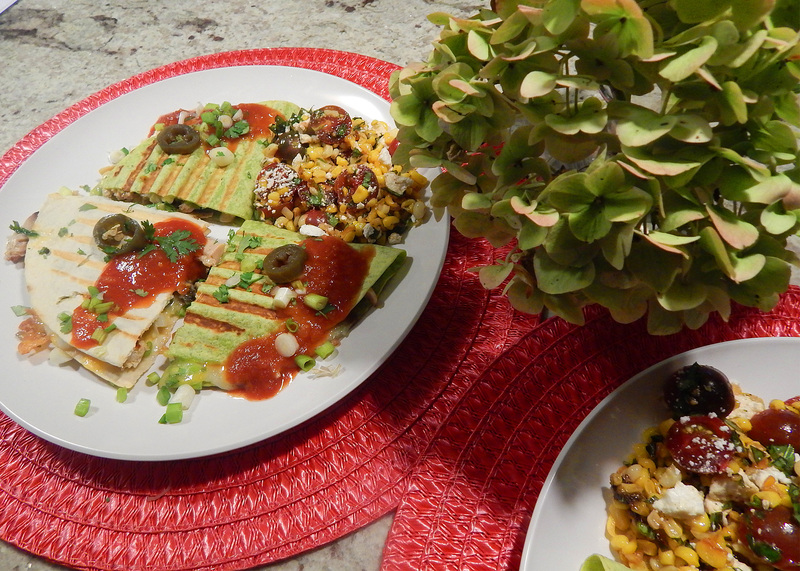 August is the perfect time to cook with some of nature’s finest bounty: fresh corn, tomatoes and basil! Whether from your garden or a local farm stand, you can’t beat their taste this time of year. And because the summer weather has been fabulous on the East Coast, the result has been a bumper crop of each. The following recipes are a combination of a favorite go-to dish in the summer, the Caprese Salad, as well as a few new ones we’ve tried—and will become go-to dishes in the future. 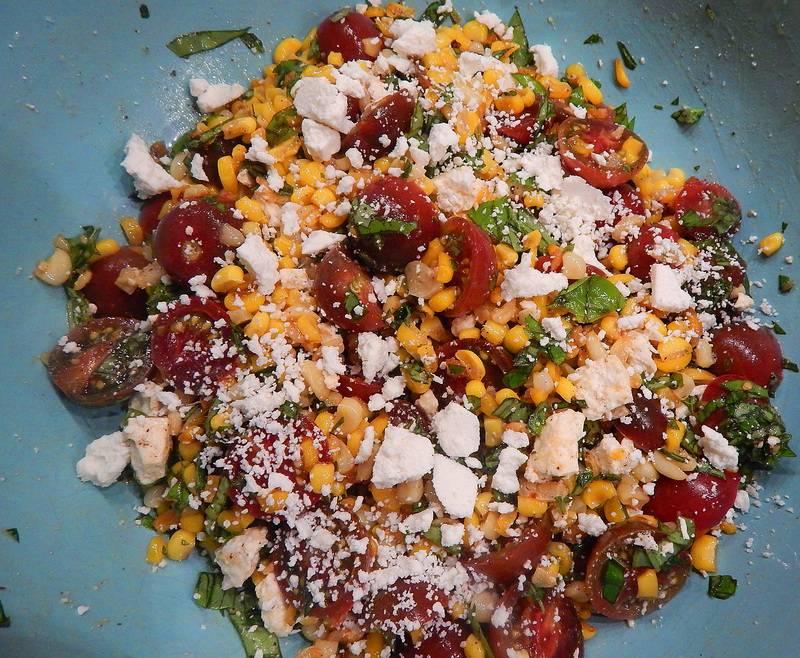 In both corn salads we used the sugar and butter corn. These first two are from the recent issue of Cook’s Illustrated, and are so flavor-packed you can’t help but oohh and ahhh with every bite. Just make sure to use the freshest ingredients possible, grocery store-bought produce most often doesn’t measure up. To create corn side dishes with rich, toasted flavor, strip the corn from the cobs when they are raw and then cook the kernels in a nearly smoking skillet. It is important not to stir the corn for a few minutes to give it a chance to brown. Once the corn is cooked, mix in plenty of salty, savory ingredients to balance the sweetness. Finally, an acidic component rounds out the dish. Because fresh corn can vary in sweetness, this recipe calls for seasoning with a range of cider vinegar. Cook bacon in 12-inch nonstick skillet over medium heat until crispy, 5 to 7 minutes. 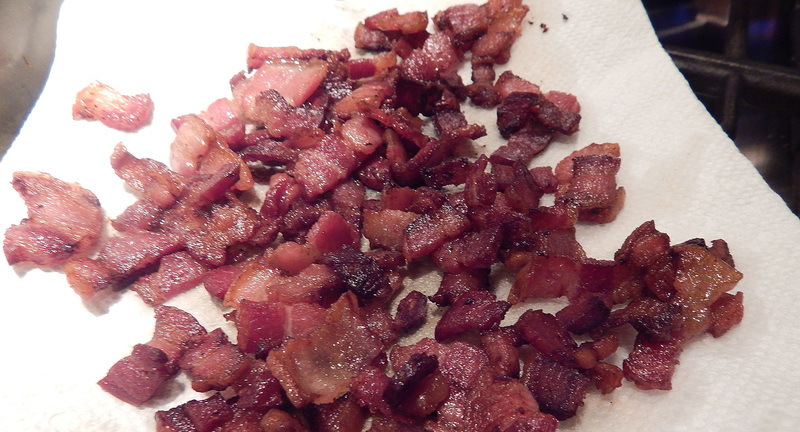 Transfer bacon to paper towel–lined plate. Pour off and reserve all but 2 tablespoons fat from skillet. Add leeks and 1/4 teaspoon salt to fat in skillet and cook over medium heat, stirring occasionally, until softened, 7 to 10 minutes. Transfer leeks to large bowl and wipe out skillet. Heat 1 tablespoon reserved fat in now-empty skillet over medium-high heat until shimmering. Add corn and sprinkle with ¼ teaspoon salt. Cook, without stirring, until corn is browned on bottom and beginning to pop, about 3 minutes. Stir and continue to cook, stirring once or twice, until corn is spotty brown all over, 2 to 3 minutes longer. Transfer corn to bowl with leeks. Stir in chives, 1 tablespoon vinegar, cayenne, and bacon. Season with salt and remaining vinegar to taste. Serve. If ricotta salata is unavailable, substitute feta cheese. Because fresh corn can vary in sweetness, it calls for seasoning with a range of lemon juice. Heat oil and garlic in 12-inch nonstick skillet over medium heat. Cook, stirring frequently, until garlic is light golden brown and fragrant, 2 to 3 minutes. Using slotted spoon, transfer garlic to large bowl, leaving oil in skillet. Return skillet to medium-high heat and heat until oil is shimmering. Add corn and sprinkle with 1/2 teaspoon salt. Cook, without stirring, until corn is browned on bottom and beginning to pop, about 3 minutes. Stir and continue to cook, stirring once or twice, until corn is spotty brown all over, 2 to 3 minutes longer. Transfer corn to bowl with garlic. There is no right or wrong way to make this versatile salad (although some may argue this point.) 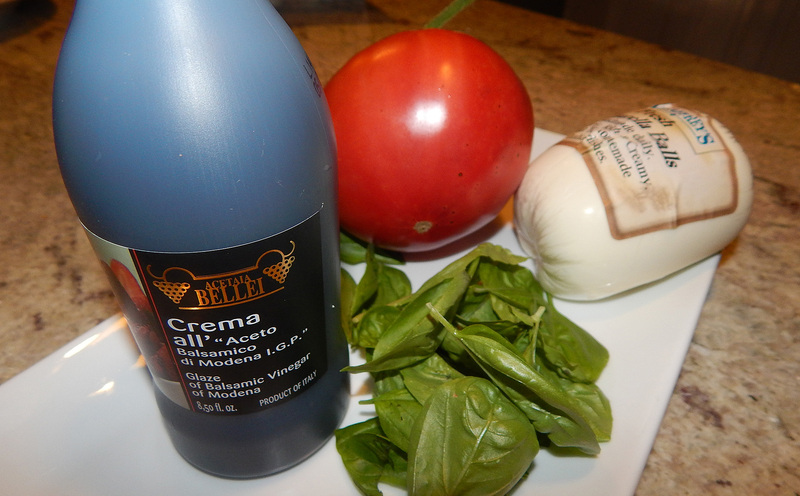 But it is imperative to use top-rate ingredients, including good mozzarella. (Is it really necessary to say this anymore??) Hothouse tomatoes and rubbery processed mozzarella are unacceptable. Over the years, I have seen this salad made with beefsteak tomato slices, grape, cherry, and roasted plum tomatoes. It can be plated, mixed in a bowl with olives, skewered and stacked. So don’t feel tied down to the list of ingredients. Experiment until you end up with your own favorite. Often seen on menus as “Insalata Caprese” (salad in the style of Capri), it originated from the Isle of Capri in the Campagna region of Italy in the 1950’s. -Basil is abundant in that country as well as the Roma style tomatoes that grow so well in the volcanic soil around Italy. -The tri-color salad of red, green and white represent the colors of Italy. 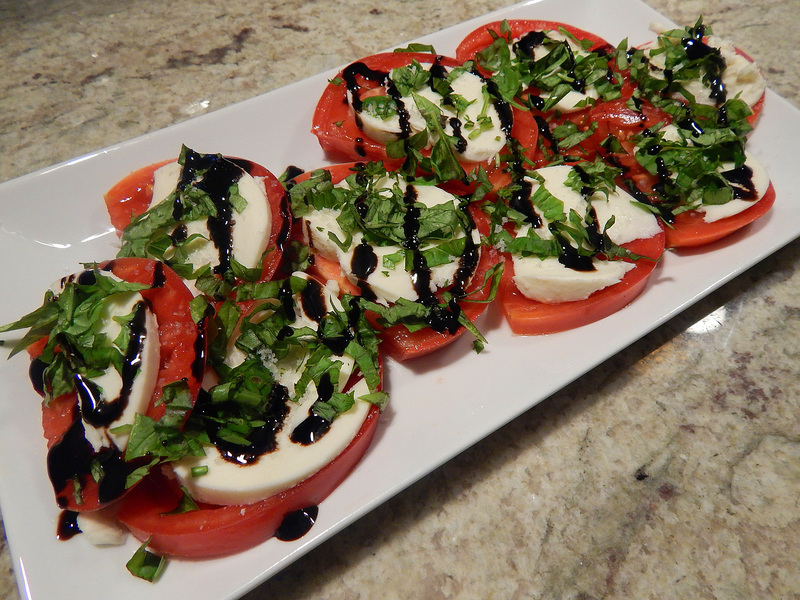 On a large platter arrange tomato and mozzarella slices and basil leaves, alternating and overlapping them. Sprinkle with salt and black pepper, spread fresh basil leaves (whole or sliced) over the salad, and drizzle with olive oil and the balsamic reduction, which can now be store-bought. 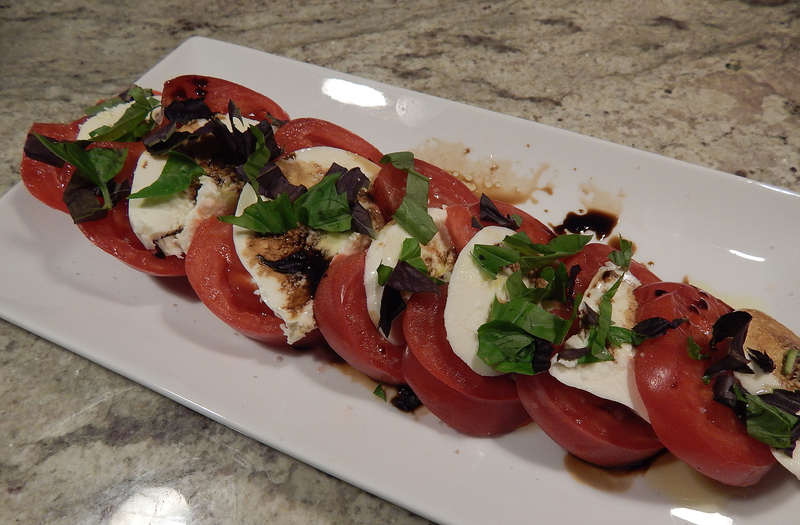 Or use small cherry or grape tomatoes and alternate with mozzarella balls and basil leaves on wooden toothpicks. 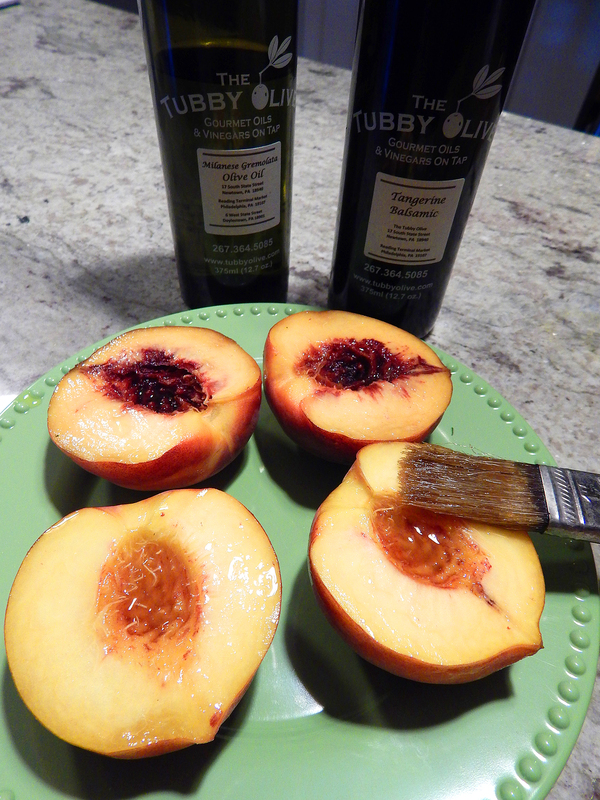 Arrange on a platter and drizzle with EVOO and balsamic reduction. 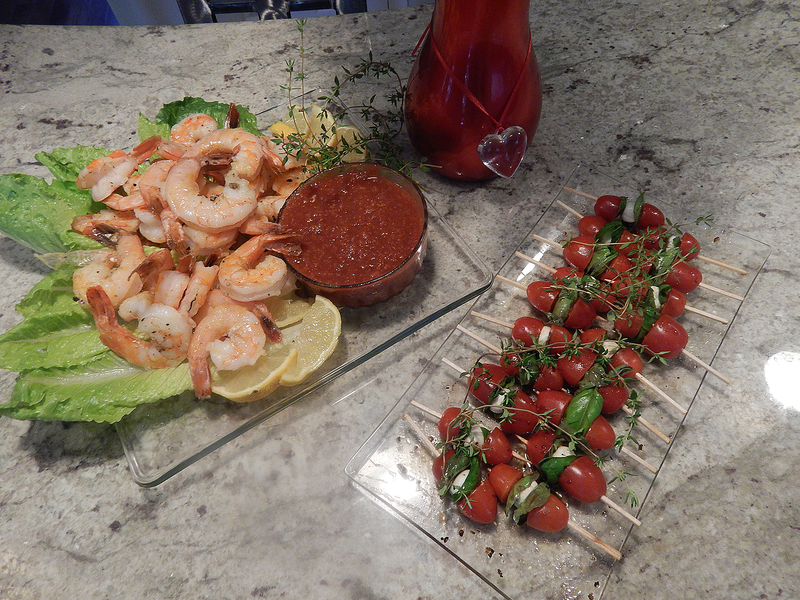 This photo was taken earlier in the summer when Rosanne Zarrilli contributed this appealing appetizer to an outdoor BBQ. Ever scratch your head and try to conjure up something different to serve as your vegetable component? I’ve often had friends ask “what else is there besides broccoli, carrots, beans and asparagus?” Here, scallions graduate from a garnish to a side, and a wonderful one at that! Scallions are usually just a pretty face. Sliced into dainty coins, they doll up a homely bowl of chili and float like lily pads in murky dipping sauces. But treat them right and they’re proud and delicious, all by themselves. 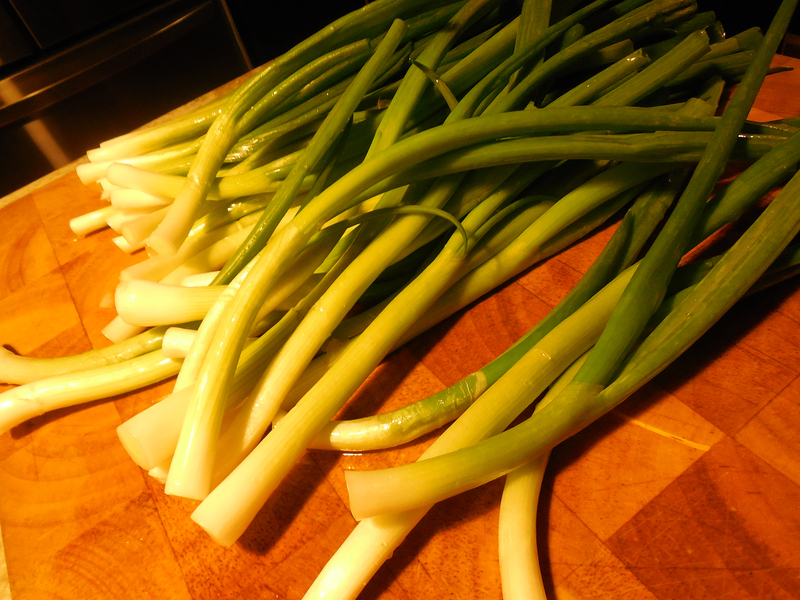 Five bunches of scallions prepped for cooking. Lop off the roots and tops, pile them in a buttered baking dish, and scatter on a bit more butter and either tarragon or parsley, depending on your mood and your herb supply (I’m a huge tarragon fan so that’s what we used). Pour in just enough water to get them steaming, then stick them in the oven to brew, tightly covered. 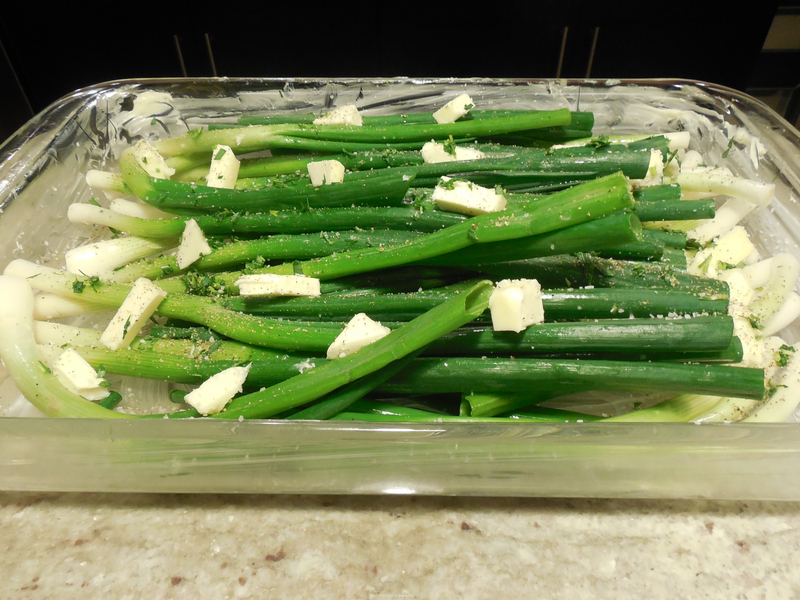 Uncooked scallions with butter and water waiting to go into oven. Heat the oven to 350 degrees. Using about 1 1/2 teaspoons of butter, generously butter a 9-by-13-inch baking dish. Trimming the scallions: Trim the root ends and 1 1/2 inches off the green tops of the scallions. Arrange half of the scallions in the baking dish so the bulb ends are lined up at one end and the greens are toward the middle. Place the other half of the scallions in the opposite direction, so you end up with a double layer of scallion greens across the center of the dish and a single layer of bulbs and each end of the dish. The braise: Pour the water into the dish. Cut the remaining butter into slivers and dot it over the top of the scallions. Season with the tarragon or parsley, salt, and pepper. Cover the dish tightly with foil, and slide onto the middle rack in the oven. Braise undisturbed until fragrant and tender, 35 to 40 minutes. The finish: Remove the foil from the dish, and increase the oven heat to 450 degrees. Roast the scallions for 10 minutes, then shake the pan back and forth to coat the scallions with the glaze that will have formed. Continue roasting until the liquid evaporates and the edges of the scallions are beginning to brown, another 5 minutes or so. Squeeze over a few drops of lemon juice to taste, and serve hot or warm. 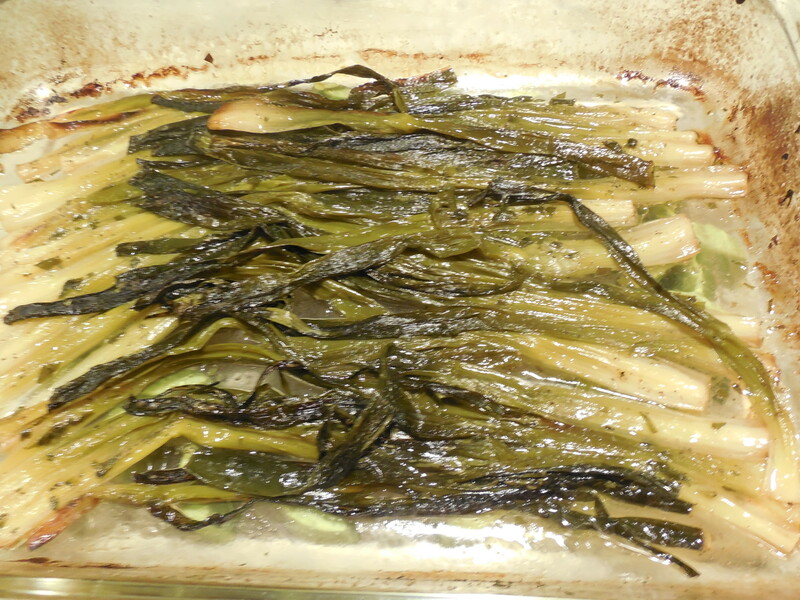 Finished dish of aromatic braised scallions fresh from the oven. 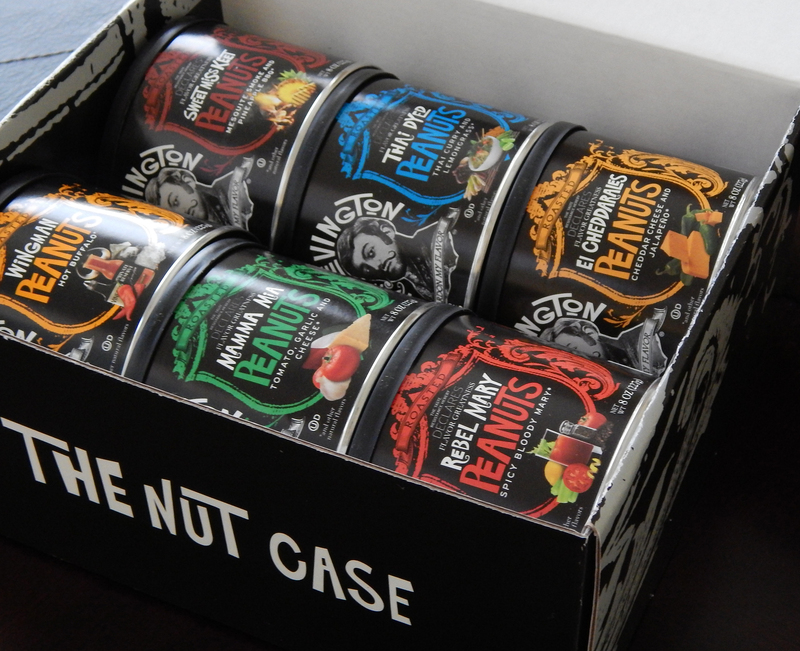 The Lord Nut Levington “Nut Case” with 6 different flavors. 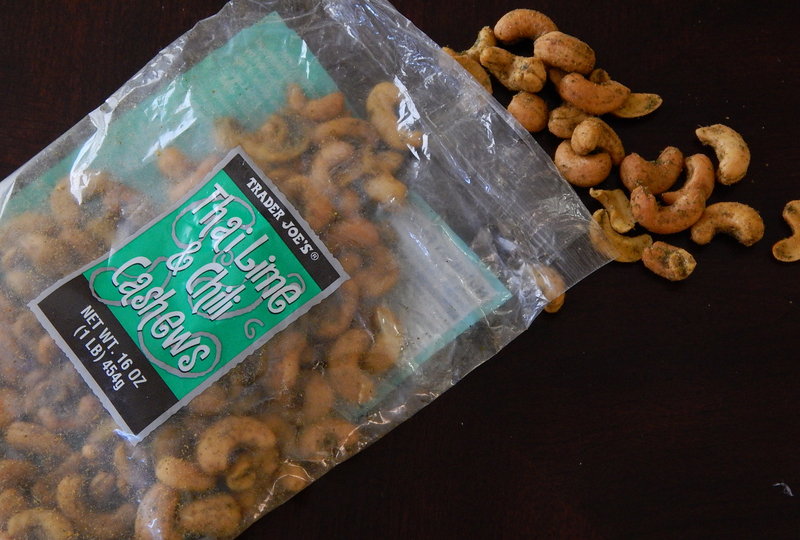 Did you ever try the Spicy Thai Lime and Chili Cashews from Trader Joes? Heaven! And Blue Diamond has an assortment of spiced nuts like Lime & Chili, Wasabi & Soy, and Habanero BBQ. Addicting! You can see how my sweet tooth morphed into a preference for savory over the years. My latest find is the Lord Nut Levington peanut selection with fabulous flavors named El Cheddarales (cheddar cheese and Jalapeño), Thai Dyed (thai curry and lemongrass), Rebel Mary (spicy bloody mary with lemon, celery and pepper), Mamma Mia (tomato, garlic and cheese), and Wingman (hot buffalo)… do these have my name written all over them or what? The minute I laid eyes on an Internet article about these nuts, I did a Google search and put in an order. Chicken stir fry with cashews. During the week I transport a homemade salad to work that includes chopped walnuts, or if I’m ordering a lunch salad at a restaurant, I prefer one that has some almonds, peanuts, walnuts, or pistachios — a salad seems incomplete without nuts! It’s not out of the ordinary for me to add some chopped nuts to cereal, hot or cold. And what a perfect snack! A holiday favorite is dark chocolate bark with almonds and a touch of sea salt. In stirfrys, they are a must-add ingredient. Even fish coated in crushed pistachios elevates the dinner to another level. Trader Joe’s Thai Lime and Chili Cashews. By now I’m sure you’ve heard of all the hype about eating nuts as part of a healthy diet that can be good for your heart. Consistent evidence for the positive health benefits continues to add up. The Mayo Clinic claims people who eat nuts as part of a heart-healthy diet can lower the low-density lipoprotein (LDL, or “bad”) cholesterol level in their blood. High LDL is one of the primary causes of heart disease. Eating nuts may reduce your risk of developing blood clots that can cause a fatal heart attack. Nuts also appear to improve the health of the lining of your arteries. Hey, whose to argue?? An apple a day may keep the doctor away, but if you want to live longer, a handful of nuts may be a better bet, researchers reported last November. The biggest study yet into whether nuts can add years to your life shows that people who ate nuts every day were 20 percent less likely to die from heart disease, cancer or any other cause over 30 years than people who didn’t eat them. Even peanuts, which technically aren’t nuts but legumes, helped. Need more convincing? Studies have found that people who eat nuts have all sorts of biological benefits: less inflammation, which is linked to heart disease and cancer; less fat packed around the internal organs; better blood sugar levels; lower blood pressure — and even fewer gallstones. Last May, researchers reported that people already eating a healthy diet who added nuts or olive oil to their diets were less likely to suffer memory loss and last February scientists reported that they cut the risk of heart attacks and strokes by 30 percent. And finally a shout-out to Marcona almonds which seem to be on all the hot menu lists and specialty food stores shelves lately. The gourmet almonds from Spain are that popular. What are they? A Marcona almond is far sweeter, moister, and delicately soft, and they’re slightly shorter and plumper in appearance compared to the traditional sweet almonds typically found at the market. Russ has been ordering them from our favorite Spanish supply company La Tienda, and knowing my passion for spicy foods and nuts, he made a fabulous treat of spicy marcona almonds which had a healthy hint of smoked hot paprika — yum! The kaffir lime leaves are also popular in Indonesian, Thai (for dishes such as tom yum), Cambodian, Burmese, Laos, and Malay cuisines. In contrast to the lime, it is the leaf of the tree, and not its fruit that is prized by cooks for the distinctive lime-lemon aroma and flavor in making Thai dishes. 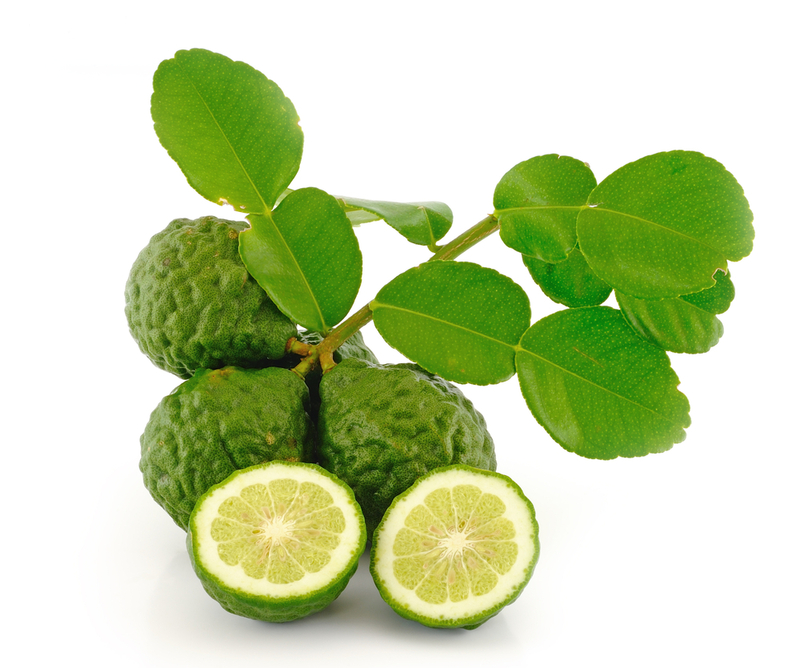 The fragrance and essence of the kaffir lime leaf is incomparable. 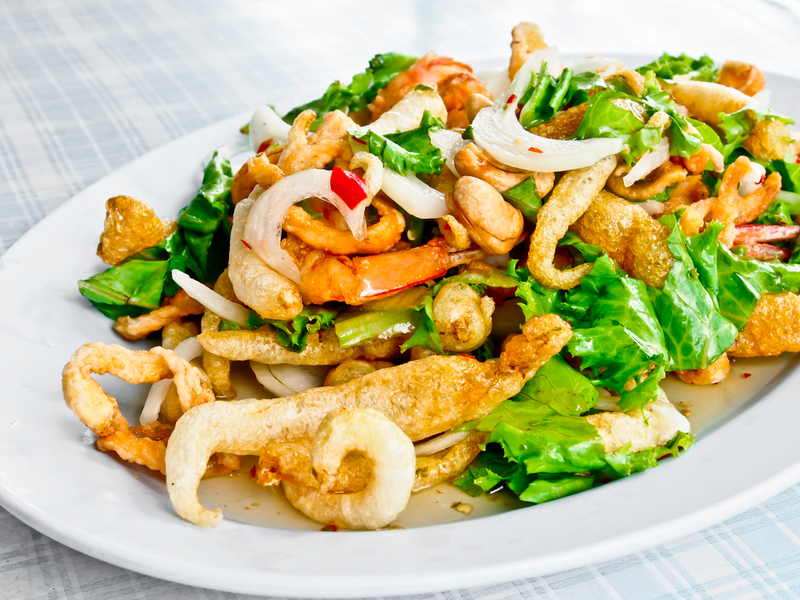 Due to their special and irreplaceable flavor, it is so important that when following a Thai recipe you should take the time to find the real mccoy. And we did just that over a decade ago when a Thai recipe from one of my Asian cookbooks called for kaffir lime leaves. We were caught by surprise (in more ways than one), first, to find them at Wegman’s in the Princeton area. The second shocker was the price — $39.99 a pound! But when you usually only need fewer than a dozen leaves, you’re actually paying for less than an ounce. Don’t ask me what recipe we made all those years ago, because I can’t remember… but what I do remember is the abundant sweet citrus bouquet that lingered to the nose and the touch, mmmmm! Another Thai recipe that I adore, is Tom Yum Soup. 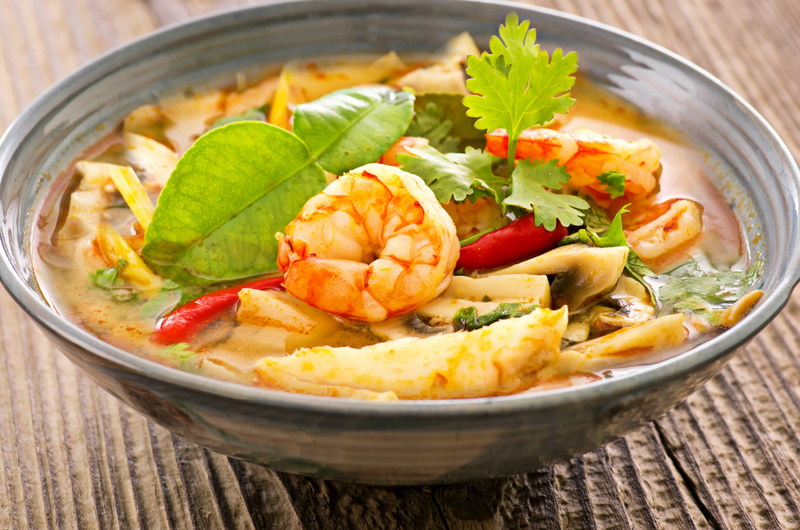 Aside from being one of the most popular soups in Thailand, Tom Yum Soup has many health benefits, due to its potent combination of herbs and spices. In fact, Thai soup is currently under scientific study, as it appears to have immune-boosting power as a natural remedy for cold and flu viruses. Included in this version of the soup (by Darlene Schmidt), is coconut milk (officially “Tom Khaa”) which adds both richness and flavor while still keeping the soup super healthy. Pour stock into a deep cooking pot and turn heat to medium-high. Add prepared lemongrass to the pot, including upper parts of the stalk you didn’t mince. Boil 5 to 6 minutes, or until fragrant. Reduce heat slightly to achieve a nice simmer. Add garlic, chili, lime leaves, and mushrooms to broth. Continue simmering for another 5 minutes. Add shrimp, bell pepper, and cherry tomatoes (if using). Simmer 5-6 minutes, or until shrimp are pink and plump. Turn down the heat to low and add 1/2 can coconut milk plus fish sauce. Test-test the soup for spice and salt, adding more chili and/or fish sauce (instead of salt) as desired. If too sour for your taste, add 1 tsp. brown sugar; if too salty, add a squeeze of lime juice. Add more coconut milk if you want your soup richer/creamier, or if it’s too spicy for your taste. Use top quality agave tequila. Thinly-slice the kaffir lime leaves. Place the sliced lime leaves at the bottom of a bowl, then add the key lime–squeezing out the juice, leaving the lime peel in the bowl. Pour your tequila over this, and cover it. Let the flavors infuse for about 10 days. That’s it! Serve over ice with a bit of agave nectar. When buying, mature darker green leaves are preferred for use over the younger, less aromatic leaves. To store kaffir leaves, place them in an airtight container or zip lock bag; refrigerate two to three weeks. Freezing is best for preserving flavor. We have whipped up many a stir fry and find they make for a quick weeknight meal while providing a healthy dose of crisp vegetables. And while we usually use a wok, this recipe called for a medium nonstick skillet which created some accumulated juices from the beef that gets added back into the mixture at the end. Use a wok or drain the juices if you desire a drier outcome. Whisk the chili-garlic sauce, soy sauce, mirin, honey, sesame oil, and cornstarch together in a small bowl and set aside. 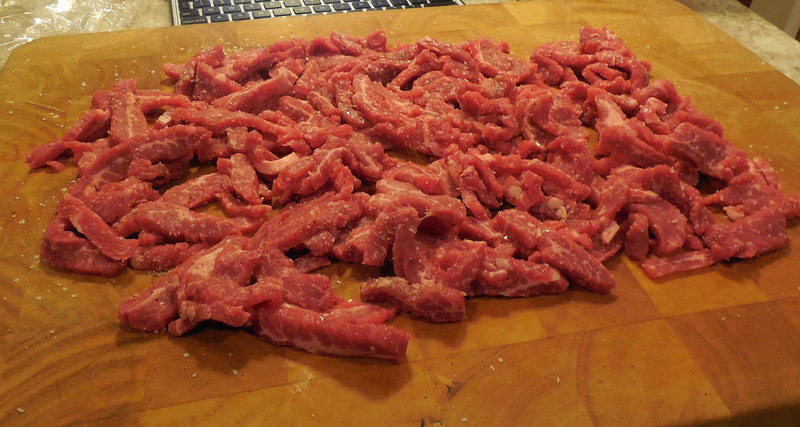 Cut the beef lengthwise along the grain into 3 or 4 (2-inch) wide pieces. Slice each piece of beef across the grain into paper thin pieces, about 1/8-inch thick. Pat the beef dry and season well with salt and pepper, to taste. Heat 1 tablespoon of the oil in a medium nonstick skillet over high heat just until smoking. Add the beef and cook, stirring rarely, until well browned, about 4 to 5 minutes. Raw meat strips cut about 1/8″ thick. Remove to a plate.Return the skillet to the stove over medium-low heat. Add the remaining 1 tablespoon of oil, half of the scallions, the garlic, and the ginger, and cook until just fragrant and starting to color, about 30 seconds. Stir in the snow peas, and cook, stirring occasionally, until bright green, about 2 minutes. Whisk in the chili-garlic sauce mixture, then remove the pan from the heat, and add the beef and accumulated juices. Toss to coat and transfer to a serving platter. Serve immediately sprinkled with remaining scallions. 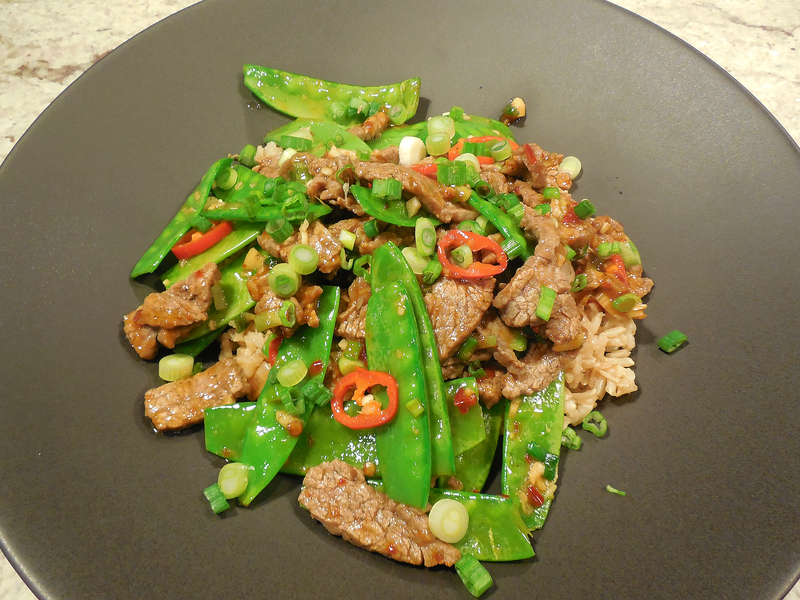 Plated Chili Beef Stir Fry with Scallions and Snow Peas over brown rice. Lynn’s spin on this recipe was to use chili sesame oil and thin slices of a Thai red pepper for color and an added heat note. We also drained off the accumulated beef juices, but might not do so the next time around. The end result was chock full of flavor and spicy enough to satisfy us. But remember, you can always tone down the heat with a few adjustments to the spice ingredients and swapping out a sweet bell pepper for the hot Thai chili. I am an avid pasta lover, mostly in the three cooler seasons. So it’s always a treat when visiting another town to come across a novelty pasta shop such as La Bottega which is all about Italy, and where I had the good fortune to spend some time last October. Nestled in the Quaint Olde Mistick Village in Mystic Connecticut, La Bottega carries only the BEST from Italy ~ from Marcato Pasta makers and Bialetti coffee pots to Fontanini displays and Murano Glass jewelry. Their pastas come in an exhilarating array of shapes and colors, and they also carry numerous sauces to go with your pasta of choice. If you are ever in that area, make sure to drop in. Of course there are many, many stores much closer to home, including local grocery stores like McCaffrey’s, Wegman’s and Trader Joe’s, to name a few, that stock a healthy assortment of interesting pasta types. And then there is always the Internet where you can search to your hearts content, but I digress. There are two basic types of Pancetta, the ″arrotolata” (rolled) and “stesa” (flat). The “arrotolata” is mainly used sliced as part of antipasti, the “stesa” is often used chopped as ingredient in many recipes. As with most recipes, we often add our own personal twist to the ingredients and/or the directions. In this case, we substituted all natural, garlic parsley fettuccine for the regular fettuccine/linguine originally called for; and definitely liked the end result! Heat oil in large skillet over med-high heat. Add pancetta, reduce heat to medium, and cook, stirring occasionally, until crisp, 8-10 minutes. Add sage and toss to coat. Use a slotted spoon, transfer pancetta and sage to a small bowl and set aside. Add squash, onion and garlic to skillet; season with salt and pepper and cook, stirring occasionally, until onion is translucent, 8-10 minutes. Add broth, bring to a boil, reduce heat and simmer until squash is soft and liquid is reduced by half, 15-20 minutes. Let cool slightly, then purée in a blender until smooth. Season with salt and pepper. Reserve skillet. Cook pasta in a large pot of boiling, salted water, until al dente. Drain, reserving 1 cup pasta cooking liquid. 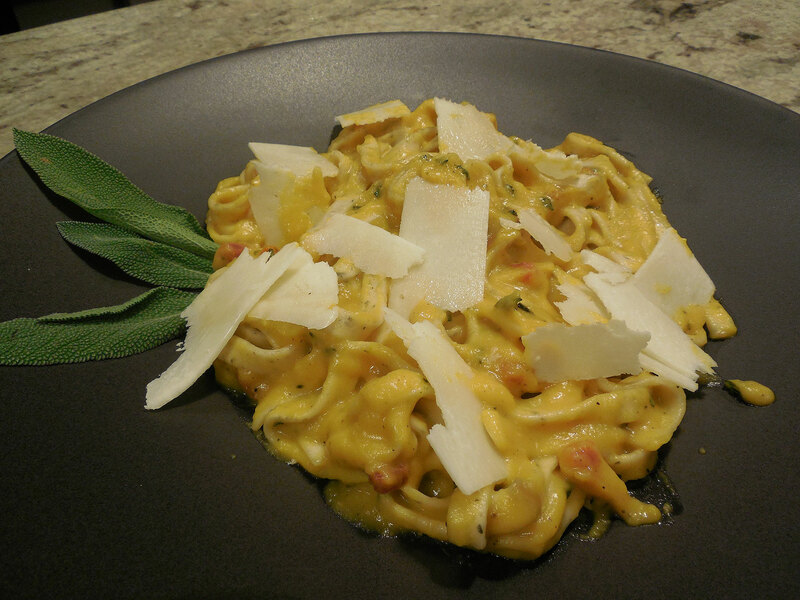 Combine pasta, squash puree, and a 1/4 cup pasta cooking liquid in reserved skillet and cook over medium heat, tossing and adding more pasta liquid as needed, until sauce coats pasta, about 2 minutes. Mix in 1/4 cup Pecorino; season with salt and pepper. Serve pasta topped with reserved pancetta and sage, shaved Pecorino, and more pepper. NOTE: Squash purée can be made up to 3 days ahead. Back in 2000 I came across an article in the July issue of McCall’s magazine (is it even in existence anymore?) 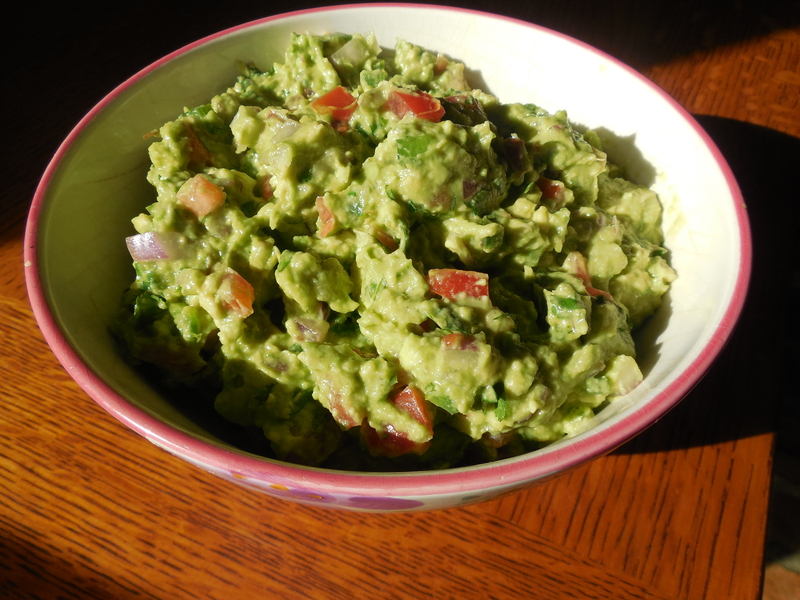 titled “Spice up Your Independence Day.” One of the recipes was for Chunky Guacamole (recipe follows.) I have made it countless times ever since and it is always a hit! Only one other guac recipe has satiated our appetites as much, and that is the homemade guacamole made right at your table in a lava stone at El Vez on South 13th Street in Philly. Alas, that experience was over a decade ago so I can’t vouch for it today. 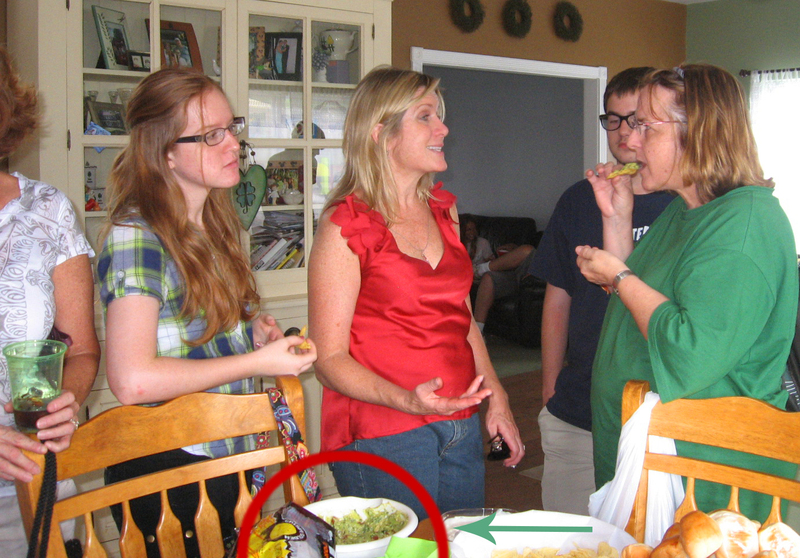 But I remember the very first time I ever attempted to make anything with avocados, back in my mid-twenties. 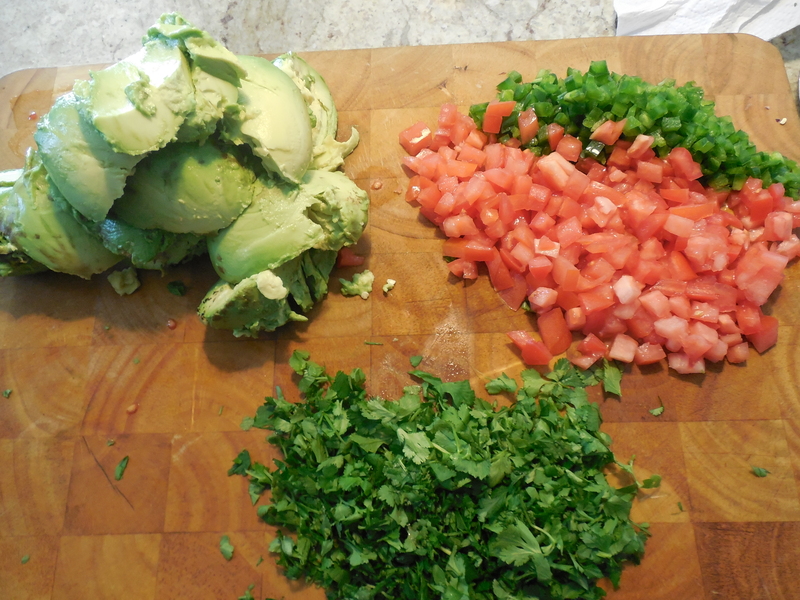 My sister Pat and I had tasted some guacamole at a local restaurant and decided we would try making our own. Either the recipe didn’t specify, or we missed the step, but we cut up the entire avocado, skins and all. Needless to say, it was a black and bitter mess. It was many years before I attempted again, but I’m glad I did. After some more hits and misses, I wondered if it was true, that if you added the pit to the guacamole, it would prevent it from turning brown. Somehow the notion had gotten out and I believed the old wive’s tale. But anyone who’s tried the method can attest, the pits are really effective at preventing browning only on the part of the guacamole’s surface they touch. While it helps minimally, the best “umbrella” seems to be plastic wrap tamped down snugly to the surface of the dip, to limit as much oxygen exposure as possible. Better yet, use lemon juice, avocado pits and plastic wrap. Or just eat it really quickly. I have found that after a day or two, the surface is darker but you can mix it in with the brighter stuff underneath and it’s still presentable. My practice has been to buy the avocados early in the week, putting them in a brown bag with bananas to encourage ripeness. By Friday night or Saturday morning when I’m ready to mix up a batch, the avocados are the perfect ripeness. However, if they ripen before you want to use them, place them in the refrigerator where they’ll last for 2 to 3 days. A WikiHow Note: Avocados are a unique fruit in that they do not ripen on a tree. They become ripe after they have been harvested, and this oftentimes occurs at your residence. Unless you are going to enjoy your avocados immediately, it is best to purchase them when they are still hard so you can control the ripening process. Once you learn how to ripen and store avocados properly, you can enjoy the tasty fruit that is loaded with nearly 20 essential nutrients, including vitamins, potassium and fiber. Place your unripe avocado in a brown paper bag along with an apple or banana if you want your avocados to ripen faster. Make sure to combine onion, slat and lime juice for twenty minutes before adding other ingredients. Scoop out the avocado, finely chop tomatoes and jalapeños, and cut up the cilantro while marinating the onion mix. The final product! If not eating right away, make sure to cover with saran wrap and tamp down so that no air is between the guar and the wrap. 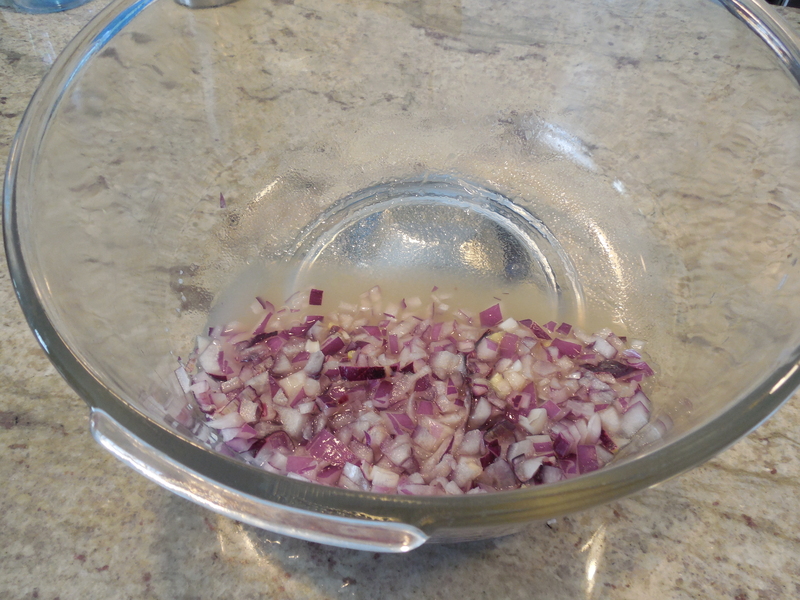 1/4 cup each finely chopped red onion and fresh squeezed lime juice. With spoon, scoop ripe avocados into bowl with onion mixture. Coarsely mash with potato masher or fork. Stir in remaining ingredients. Cover surface directly with plastic wrap; refrigerate up to 24 hours before serving. Serve with tortilla chips or as an accompaniment to other Mexican food. Great on super nachos too. So go ahead and make a batch for your Superbowl party! 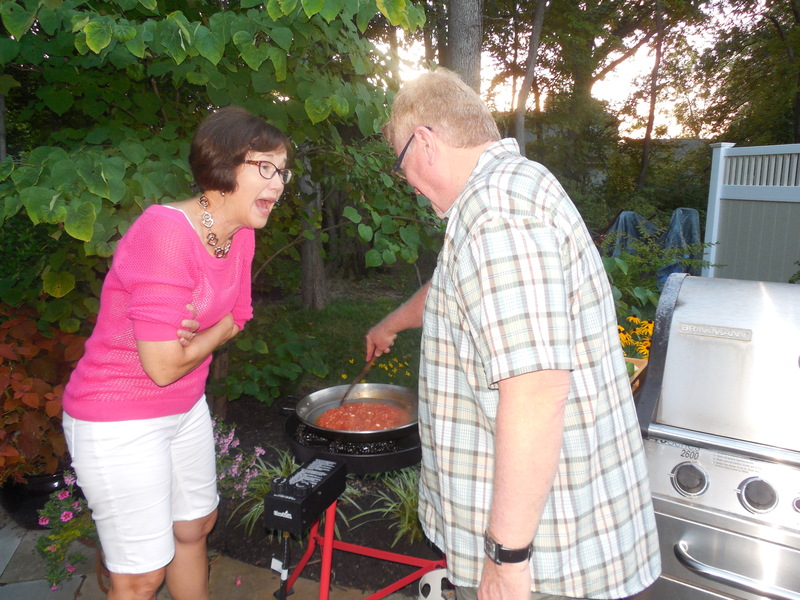 Karen Mortka is amazed over the fact that Russ is grilling a paella! Russ has a penchant for everything Spanish and so it was no surprise when he purchased a “grill” specifically to accommodate his paella pans. (You can also use the device for a variety of other cooking methods and recipes and in tandem with your other grill.) 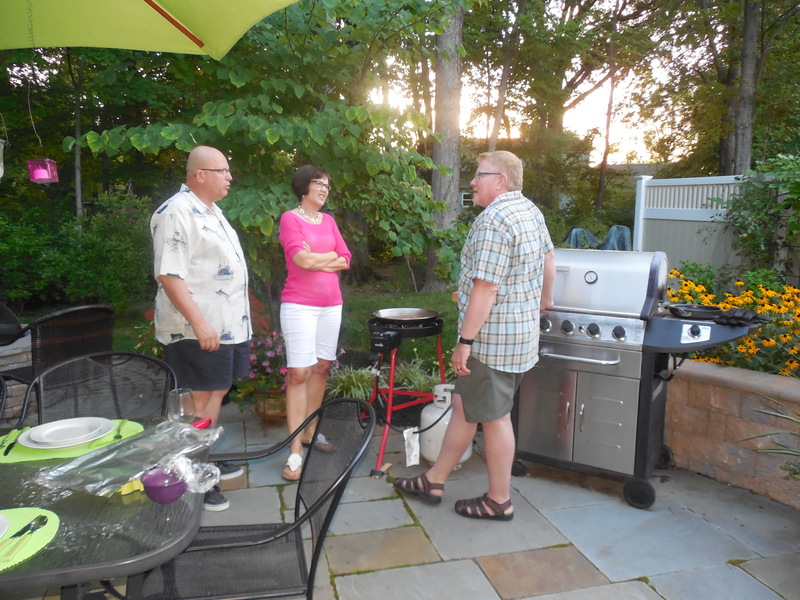 And so it was, the maiden voyage of this grill, last August in our backyard entertaining Karen and Ed Mortka. Now you have to understand when I say Russ “has a penchant for everything Spanish,” I’m not kidding! Pretty much every single ingredient that went into the paella, other than the fresh fish, was imported from Spain. (Russ is also fluent in speaking Spanish, watches Spanish television and reads Spanish novels and newspapers.) We — mainly Russ — have made many paellas over the years, but this one was the first time we “grilled” one. Ed Mortka is concerned that his wife Karen may be getting too interested in purchasing her own paella grill after the “how-to” lesson from Russ. 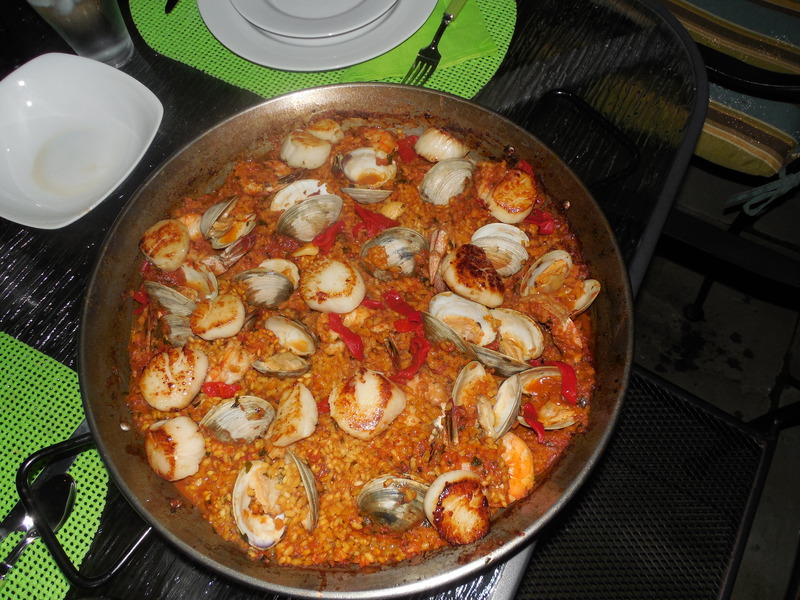 Paella perfection, with clams, shrimp and scallops cooked with saffron and piquillo peppers. The main dish was based largely on a recipe from The New Spanish Table, a recipe book by Anya von Bremzen who divides her time between Spain and New York. Russ combined Anya’s recipe with some alterations he noted from a paella recipe in Fine Cooking. We omitted the monkfish and squid (not something Lynn is fond of!) So instead we added scallops. Russ sautéed them on the “other” grill and added them on top of the finished paella. 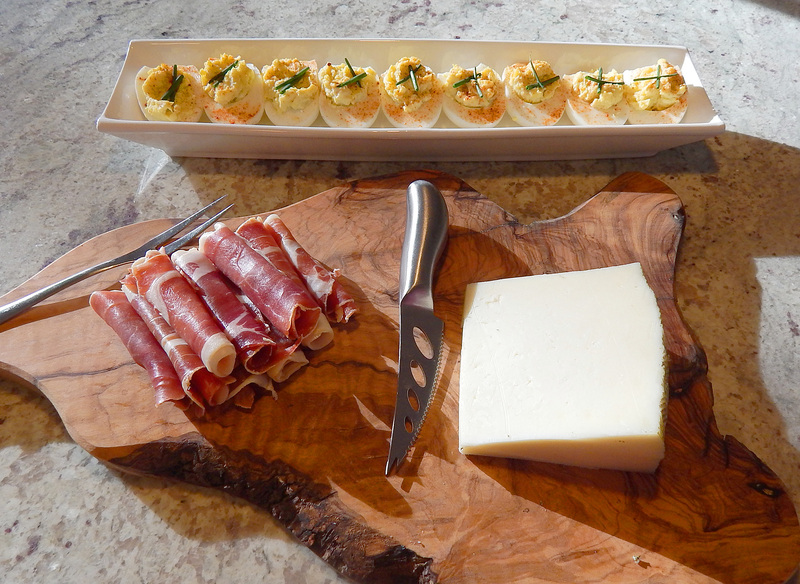 The dinner started with an awesome baked manchego cheese appetizer with honey and marcona almonds that Karen brought. To die for! And for dessert Russ made a wonderful flan with fresh strawberries, all in keeping with the Spanish theme of course!